Load: 260 kg. 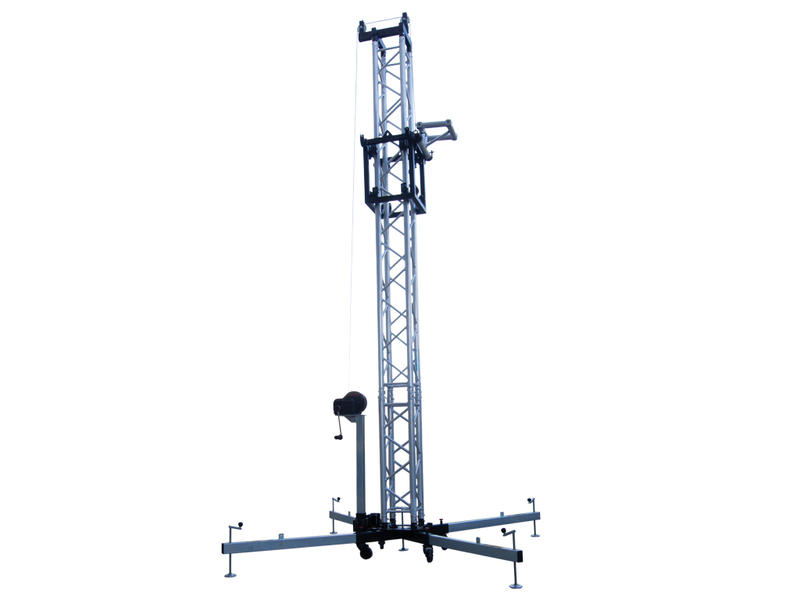 Height: 6.30 m.
Modes of operation: Mechanism Mode and Structural Mode. Five extensible profiles made of extruded aluminium. Compatible accessories: AWS 403, AWS 302, AWS 401. Load: 380 kg. 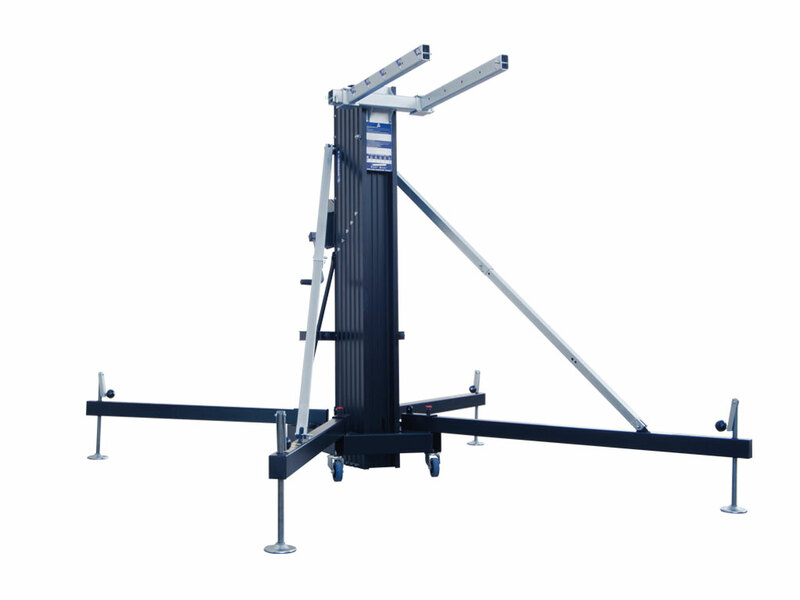 Height: 5.09 m.
Load: 510 kg. 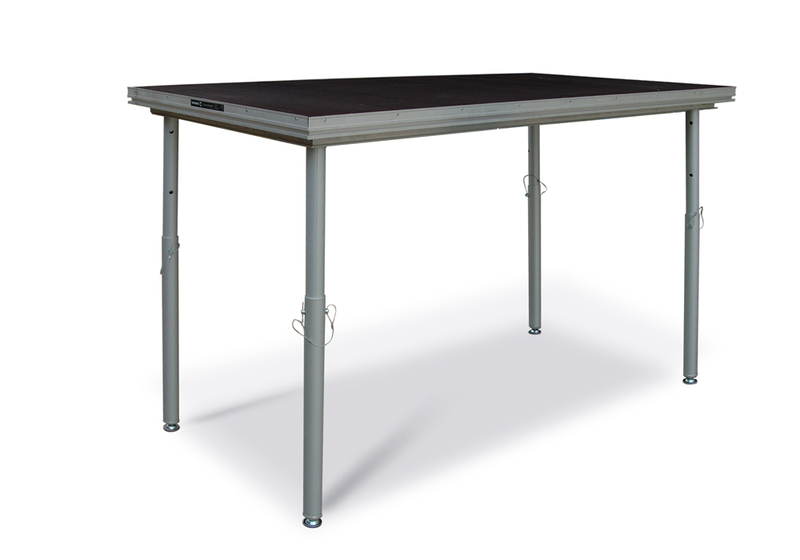 Height: 6.08 m.
Compatible accessories: AWS 402, AWS 302, AWS 401. Load: 700 kg. Height: 8.13 m.
Six extensible profiles made of extruded aluminium. 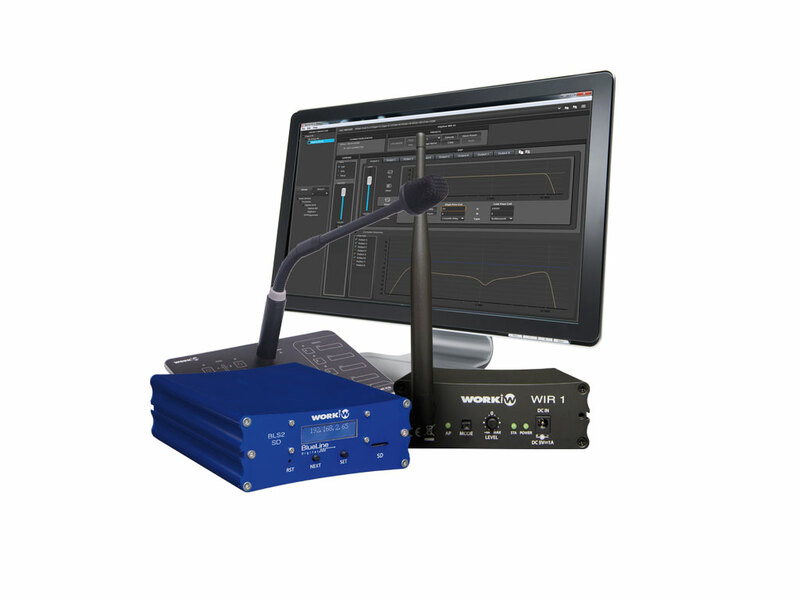 Compatible accessories: AWS 502, AWS 301, AWS 501. Load: 900 kg. Height: 5.2 m.
Load: 1200 kg. 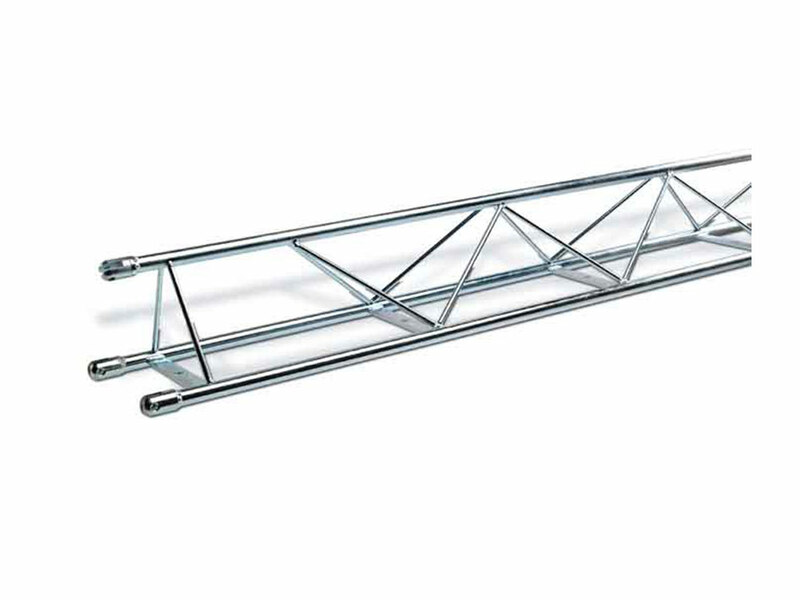 Height: 6 m.
2 bars behind the lifter for additional reinforcement. 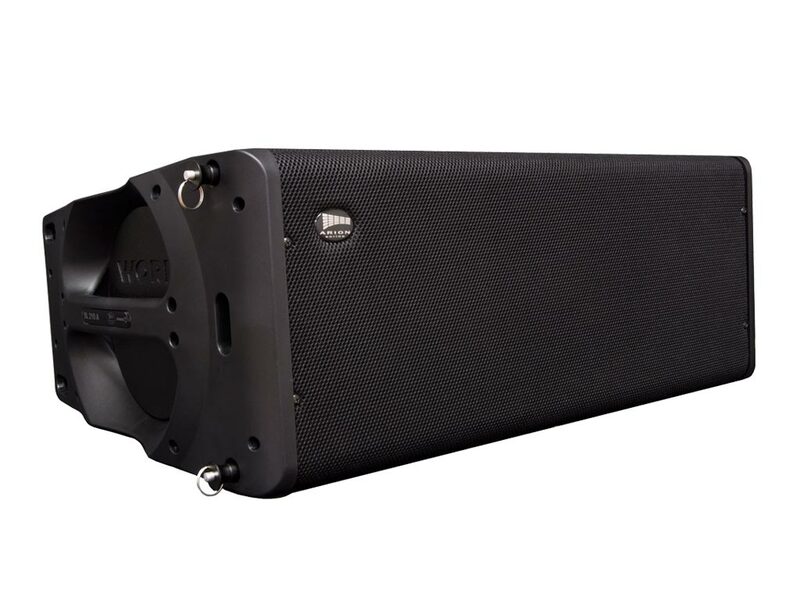 Exclusively designed for small and medium-size Line Array systems. 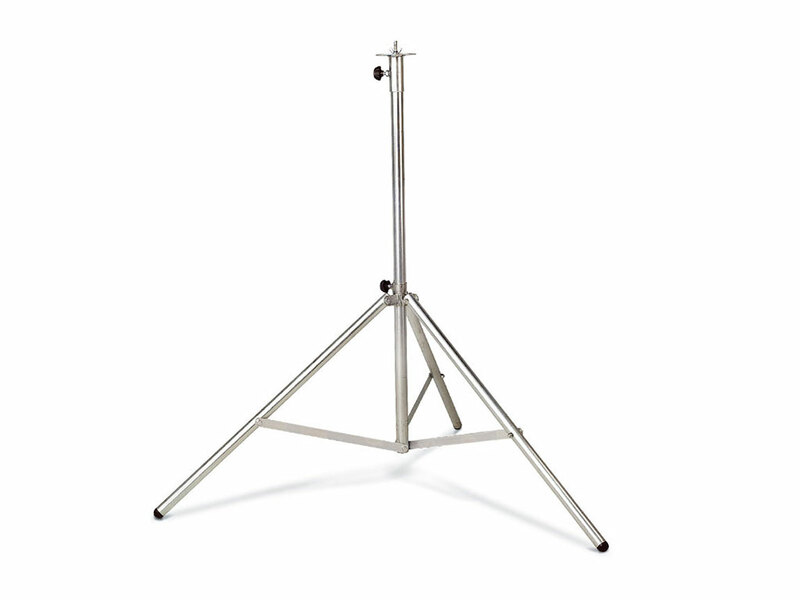 High resistance struts and stabilizers with rubber feet. Three profiles made of extruded aluminium. 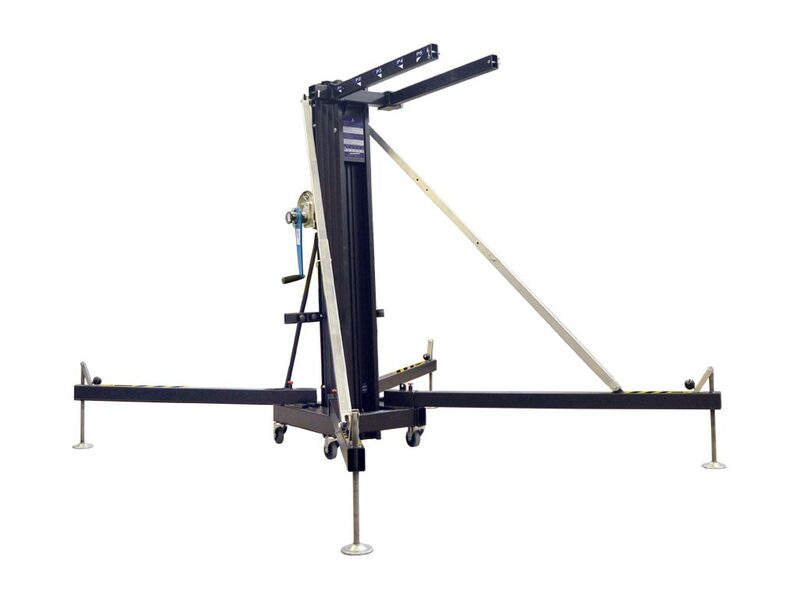 Dual reinforcing bars behind the lifter for additional reinforcement. 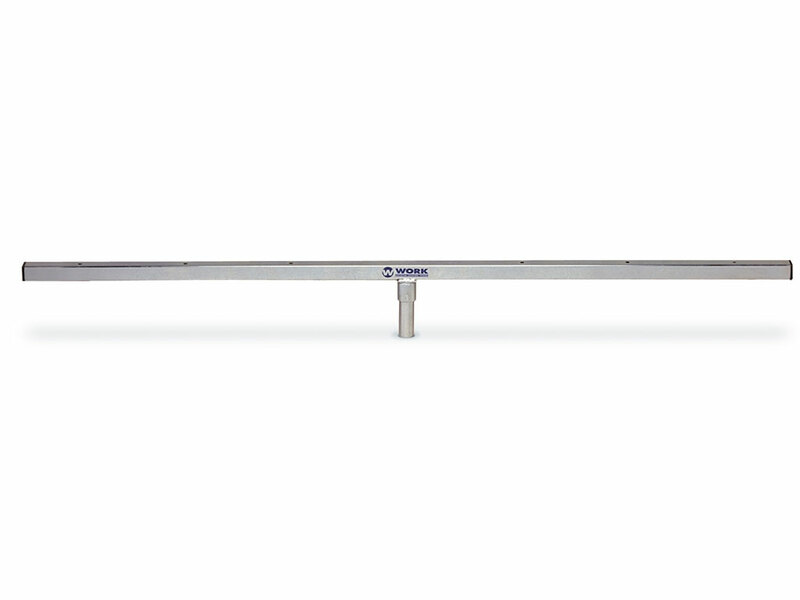 LW 415 R features an integral spirit level for safety ensuring lifter balance. 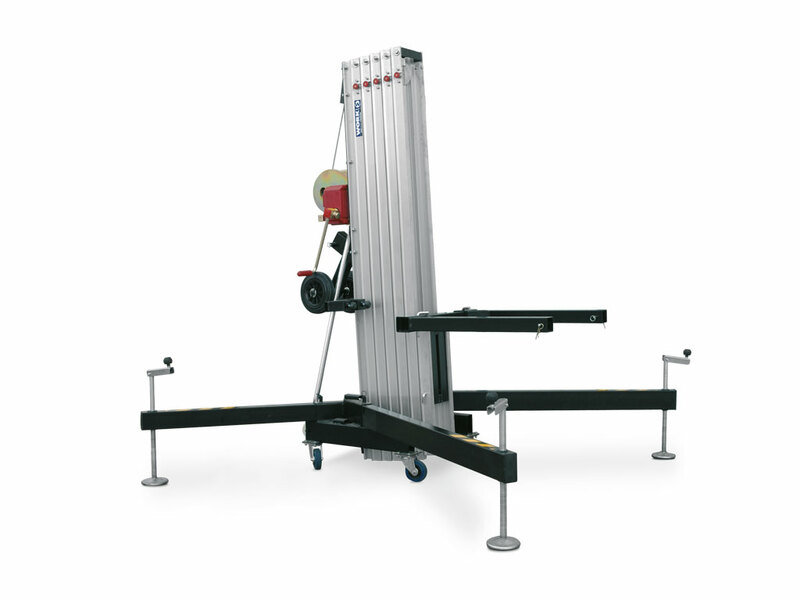 Protects the load against involuntary movement during lifting operation. 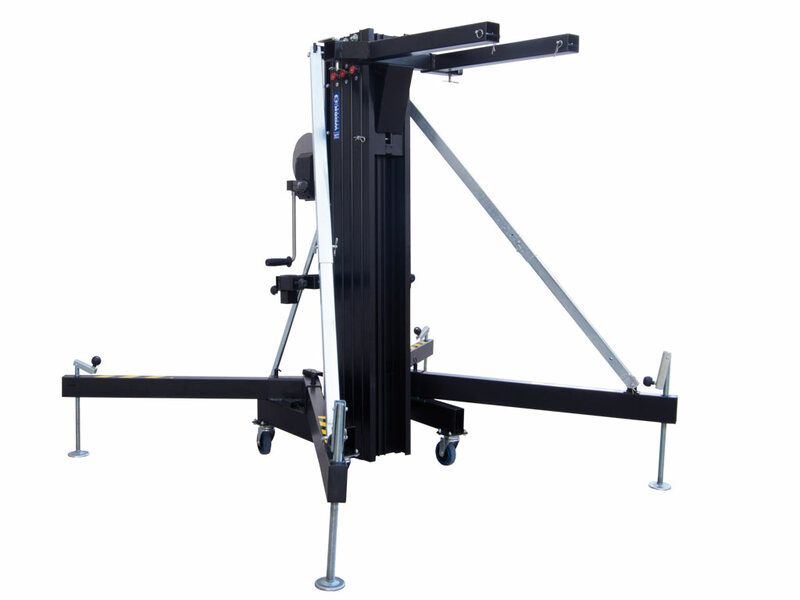 Like for all the lifters of the 400 series, four wheels have been added at the base of the lifter to move it easily. 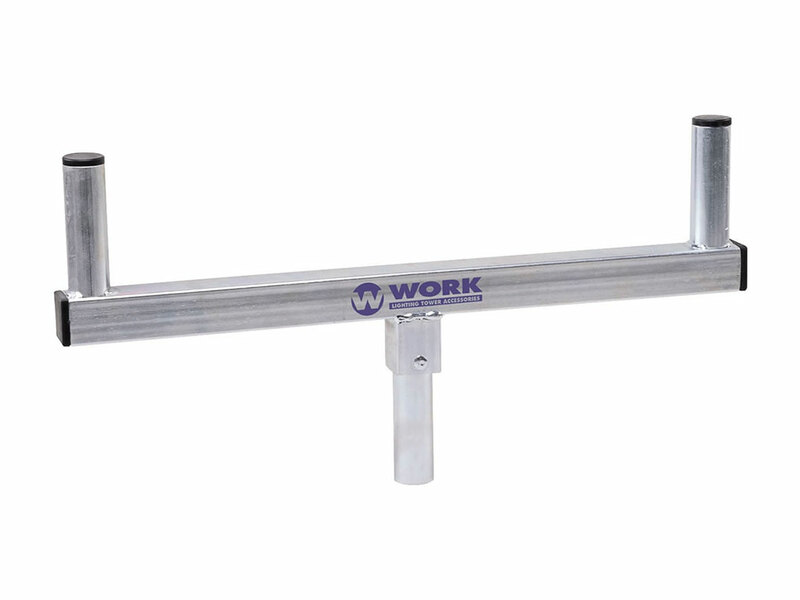 LW 425 R features an integral spirit level for safety ensuring lifter balance. 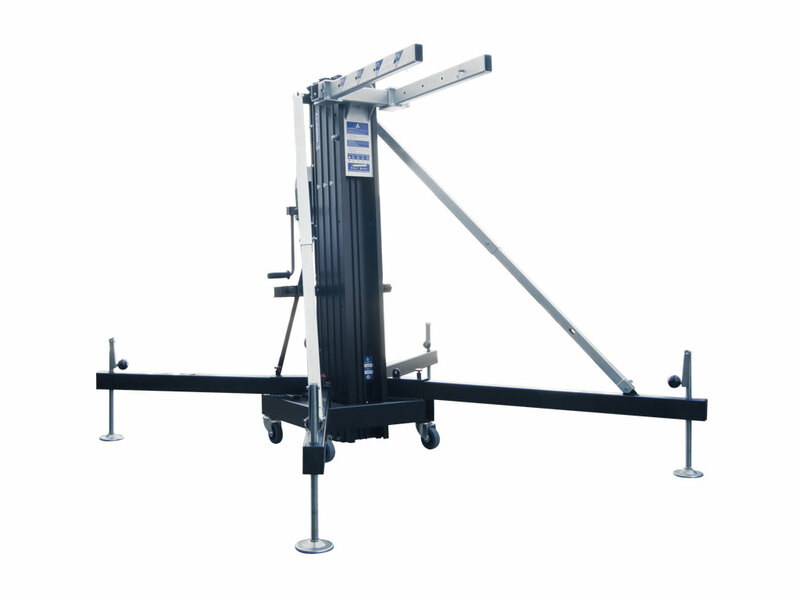 Protects the load against involuntary movement during lifting operation. - Five profiles made of extruded aluminium. 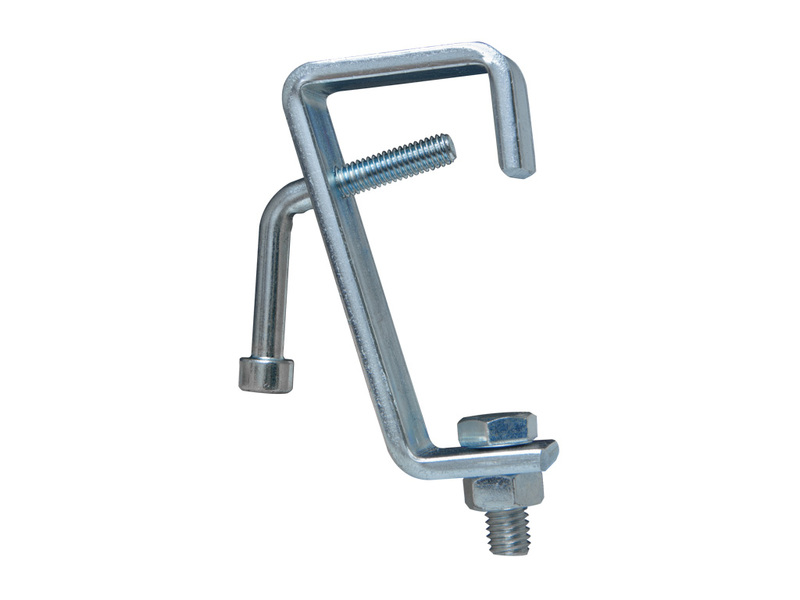 - Powerful, oversized auto-locking bolts. 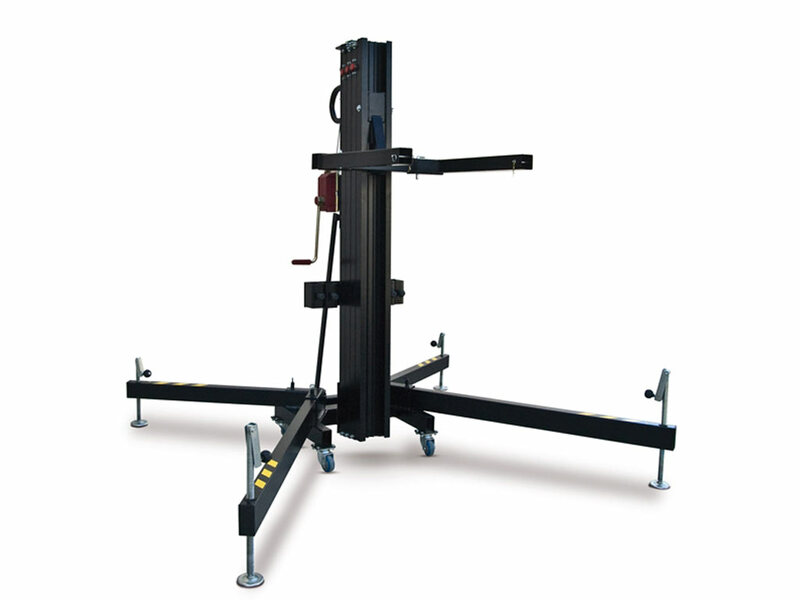 - Dual reinforcing bars on the back of the lifter for additional reinforcement. - Internal Pendulum System (IPS). 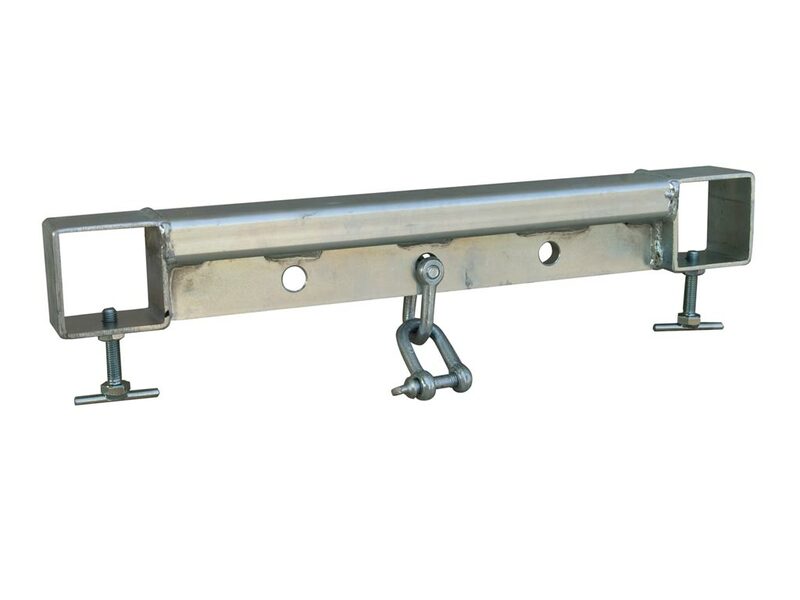 - Castors at the base of the lifter and two additional castors for horizontal transportation. 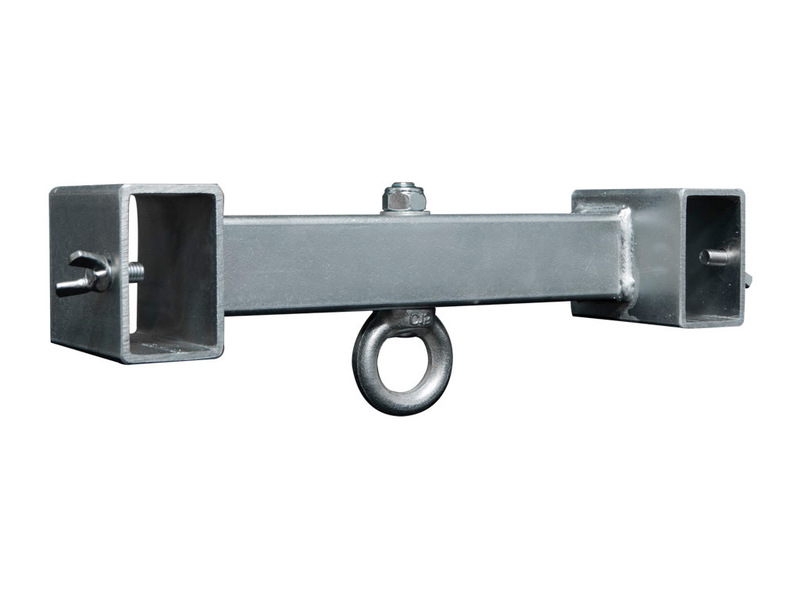 - Triple safety construction secures profile sections: automatic-brake winch, auto-locking bolts and internal pendulum system (IPS). 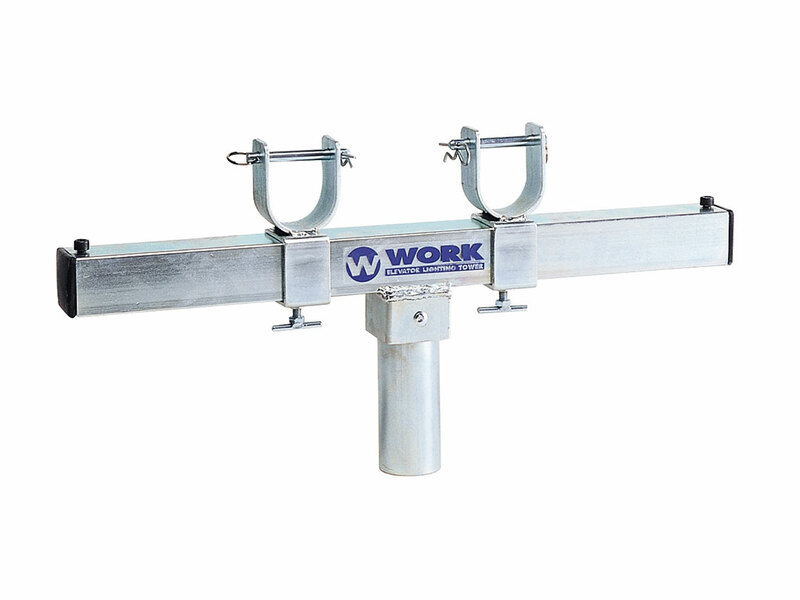 - New Internal pendulum system (IPS) by WORK®. 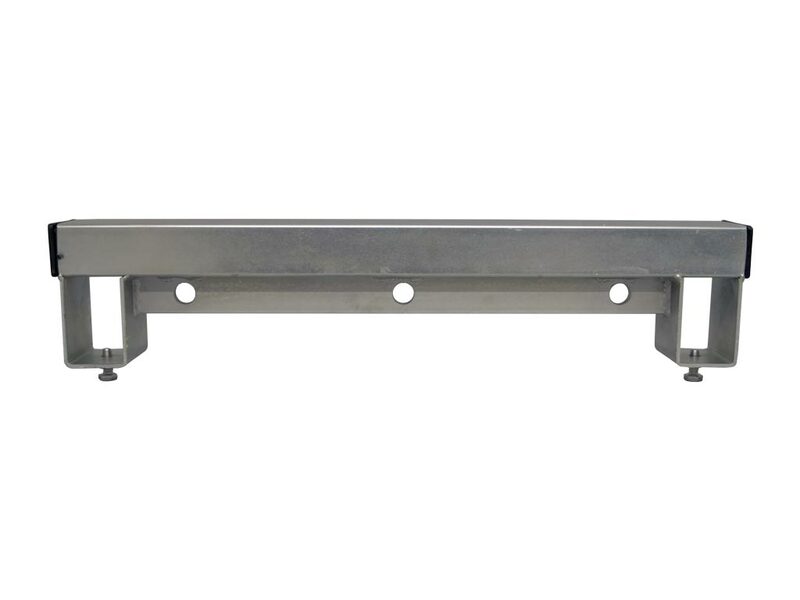 Locks profiles together for maximum security. 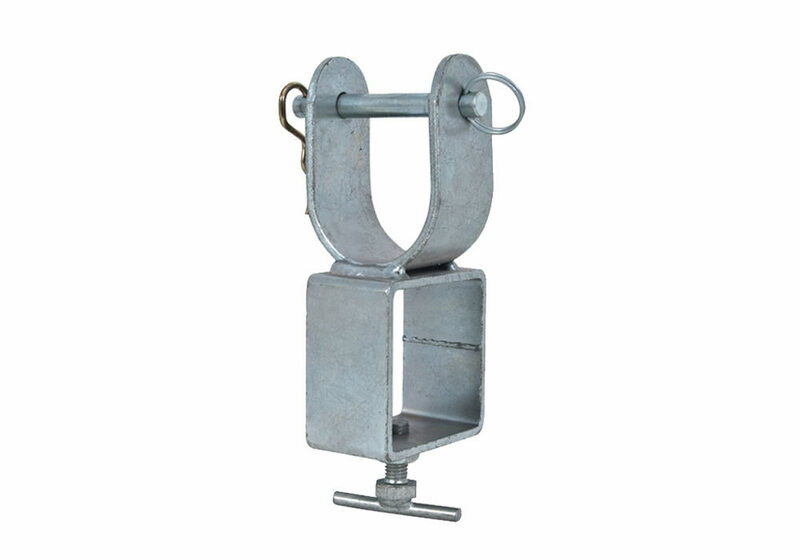 - Dual reinforcing bars at the back of the tower help to withstand the weight of the load during operation. 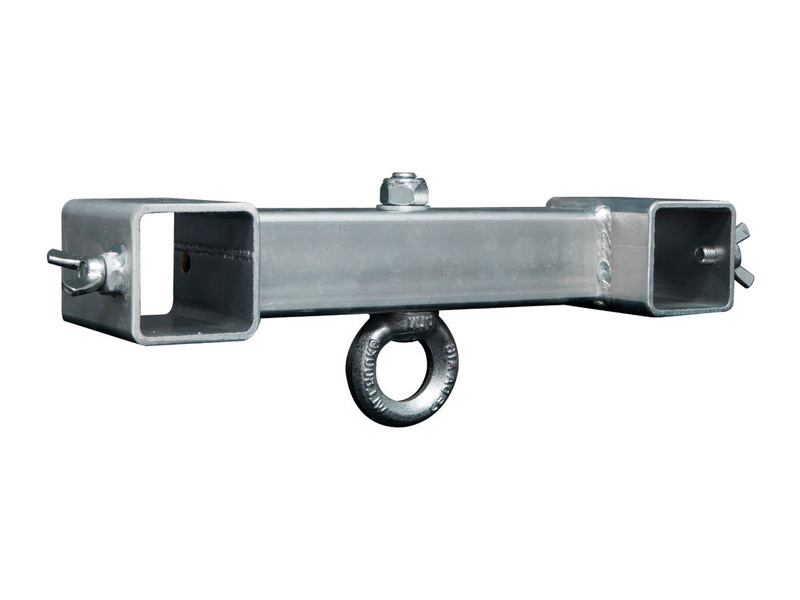 - Powerful oversized locking bolts designed to support heavier loads with ease during lifting operations. 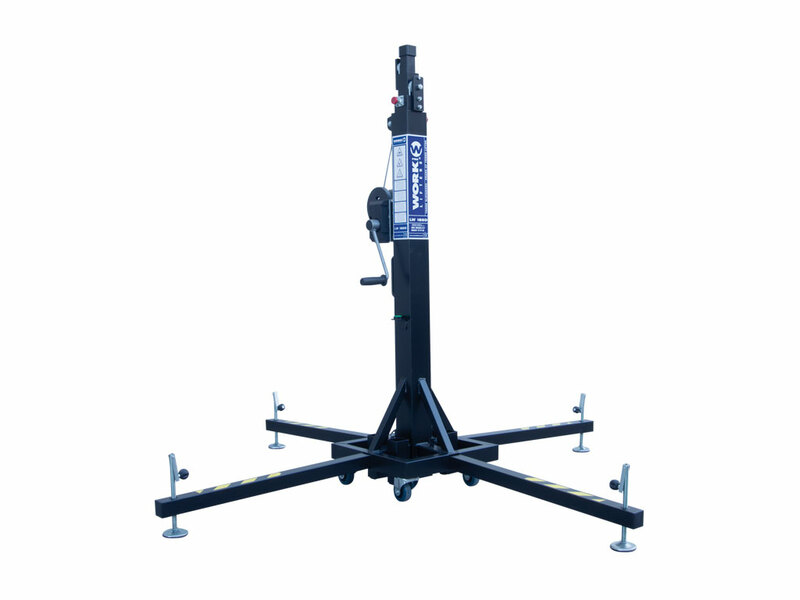 - Two additional castors and a tow handle for transporting the lifter in horizontal position. 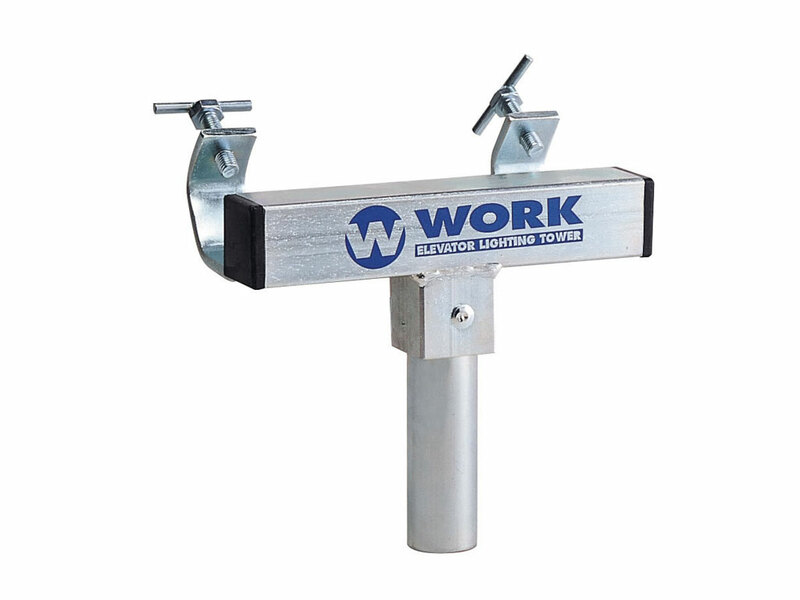 - WORK® cares particularly for the quality of automatic brake winches manufactured to standard VGB 8/10.93 as a norm. 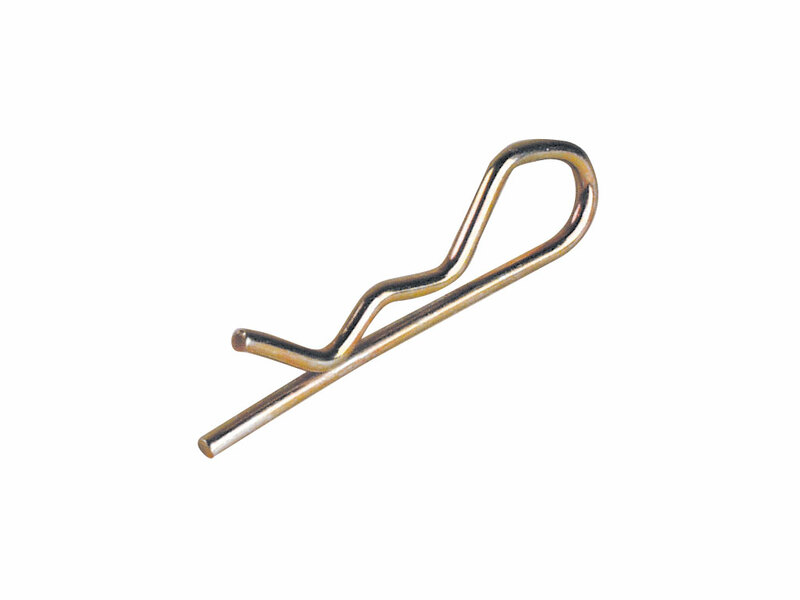 - Profiles are reinforced on both sides to reduce stress when the profiles are deployed. 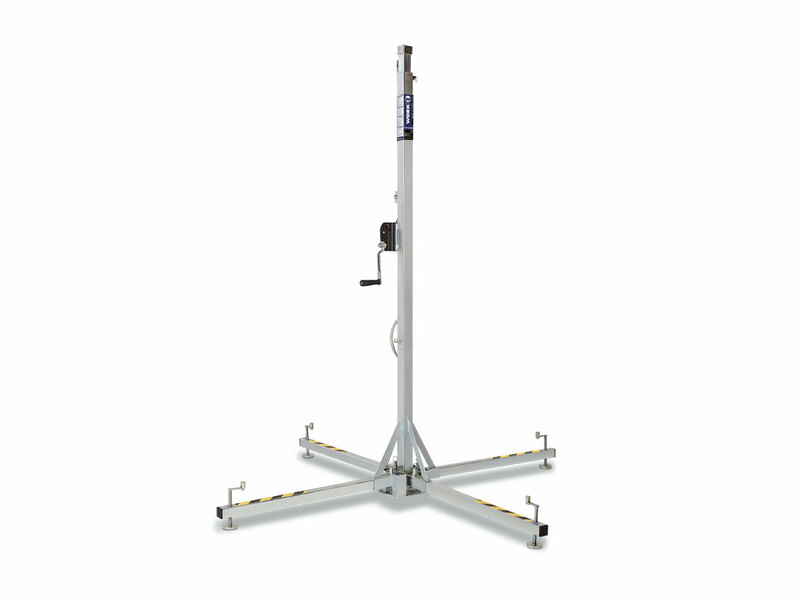 - All lifters from the 400 series are fitted with castors making movement effortless. 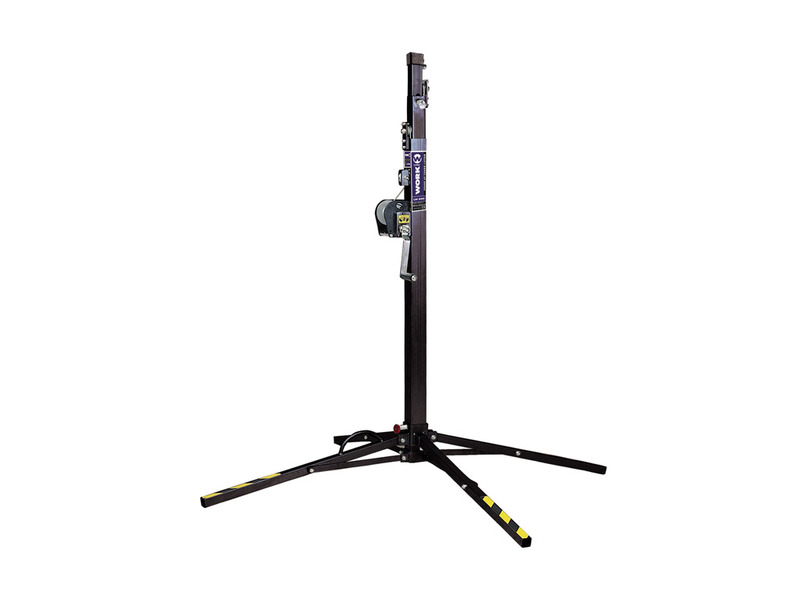 - Convenient stowing bracket for stabilizer legs during transportation. 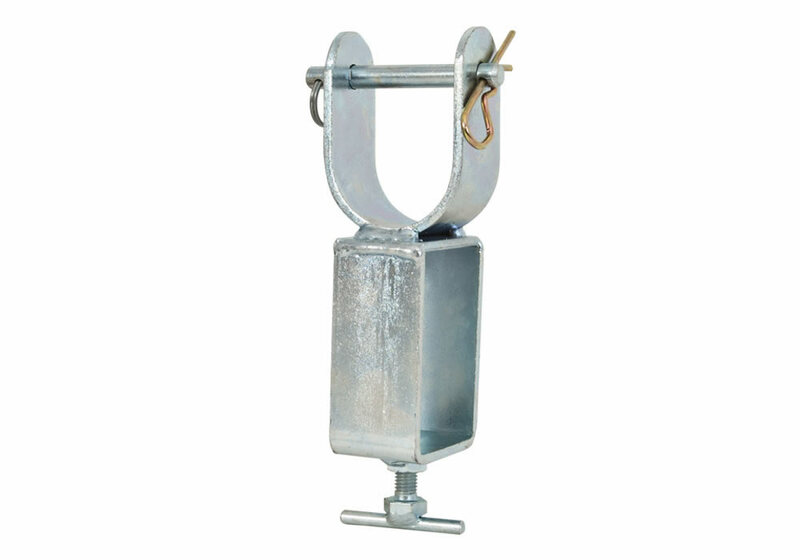 - Oversized heavy duty steel cable designed to withstand repeated fold/unfold operations with ease - Cable guard guides and protect cables from damage and injury. 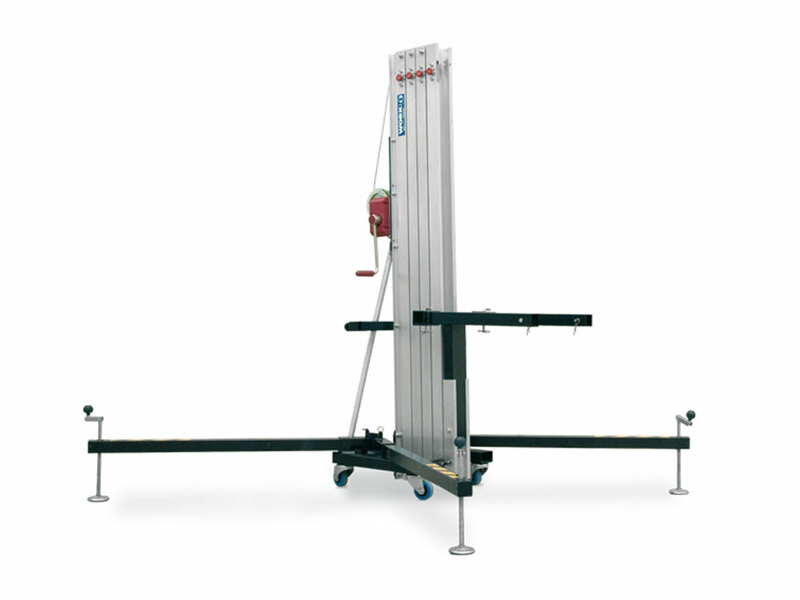 - LW 480 R features an integral spirit level for safety ensuring lifter balance. 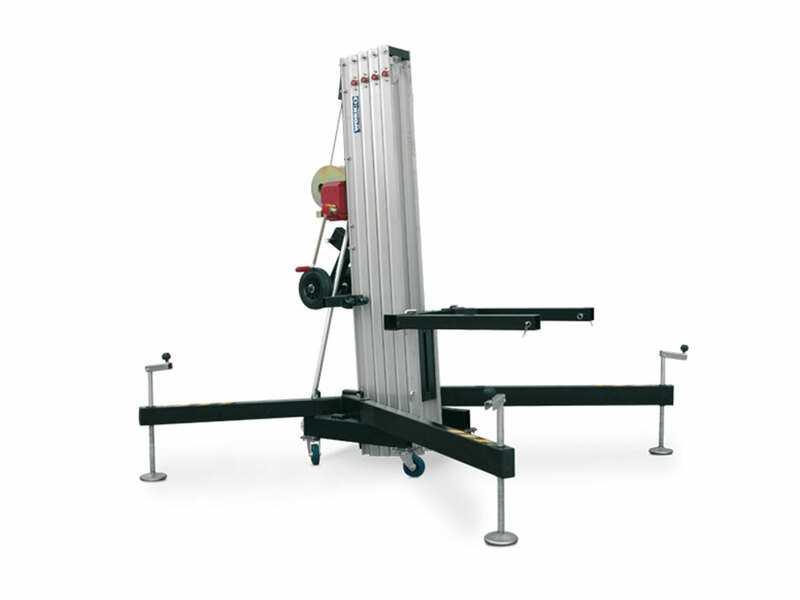 Protects the load against involuntary movement during lifting operation. 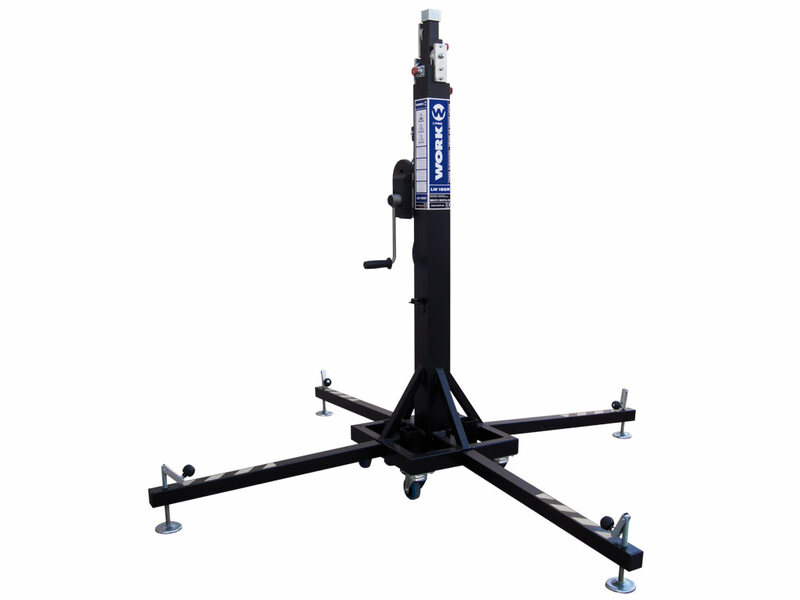 - All lifters from the 400 series feature high resistance struts and stabilizers with rubber feet. 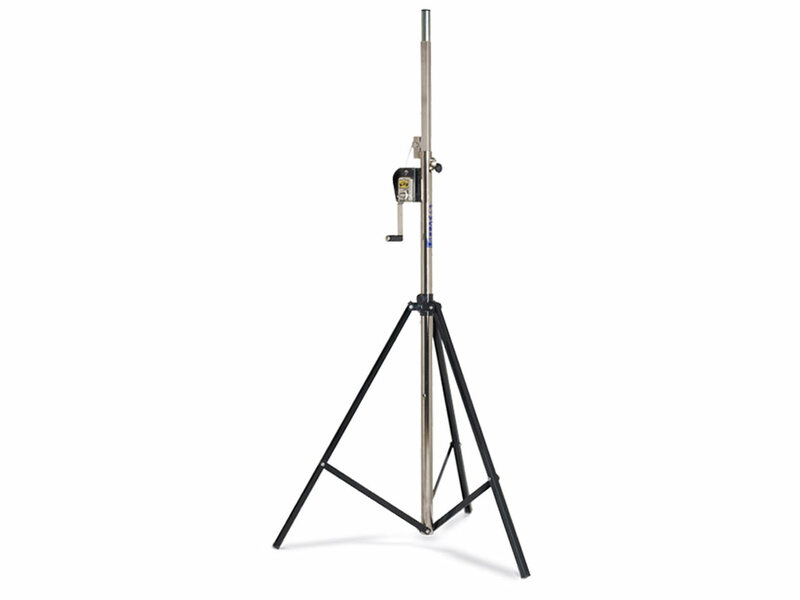 Professional lighting stand for follow spots. 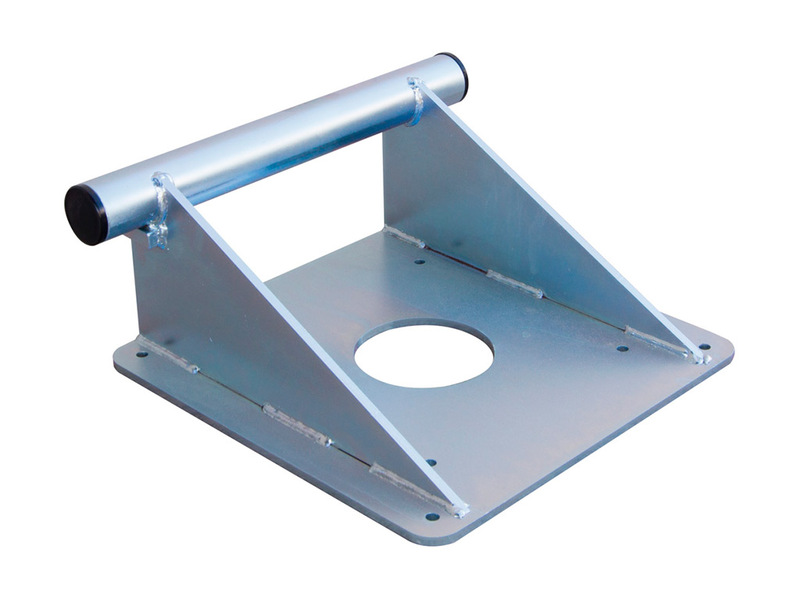 Adapter for follow spot (CP1). 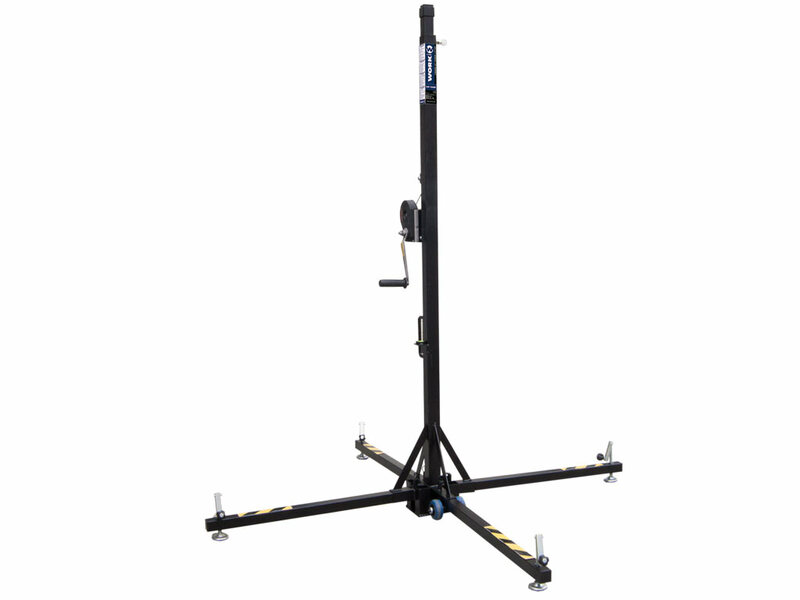 - Professional stand for followspots. 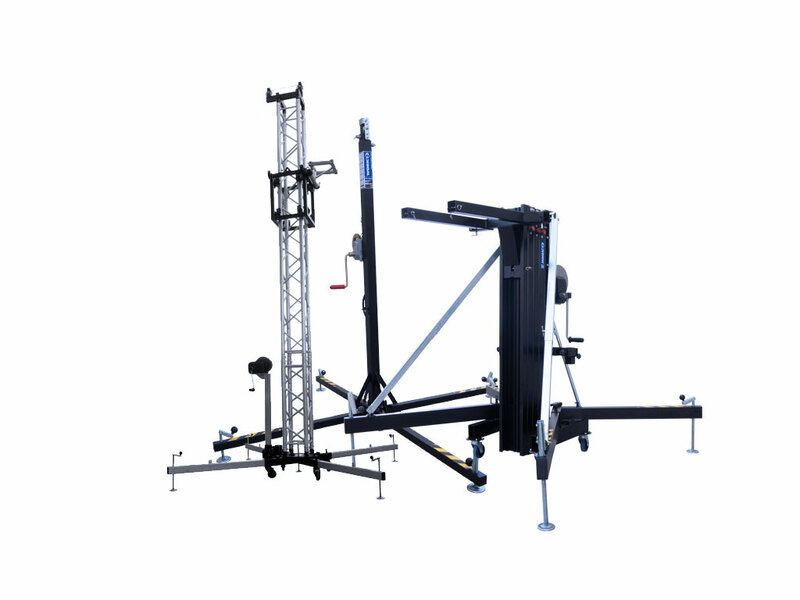 - This lighting fixture has an efficient folding system. 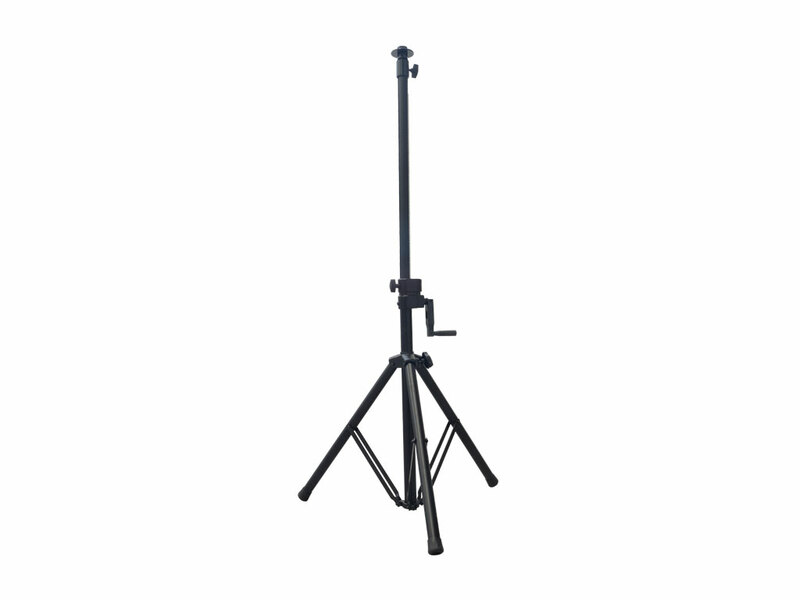 Foldable and extensible lighting stand. Suitable with many accessories thanks to 35 mm diameter (male). 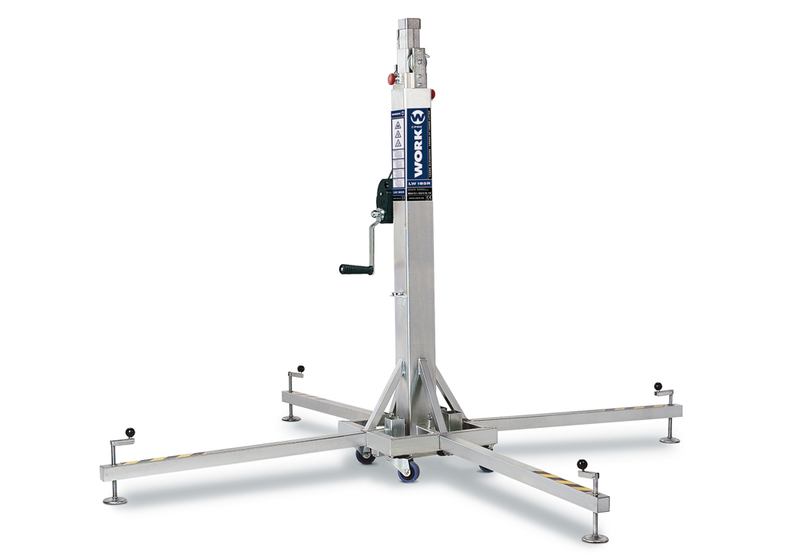 Extensible mast, using the automatic-brake winch. 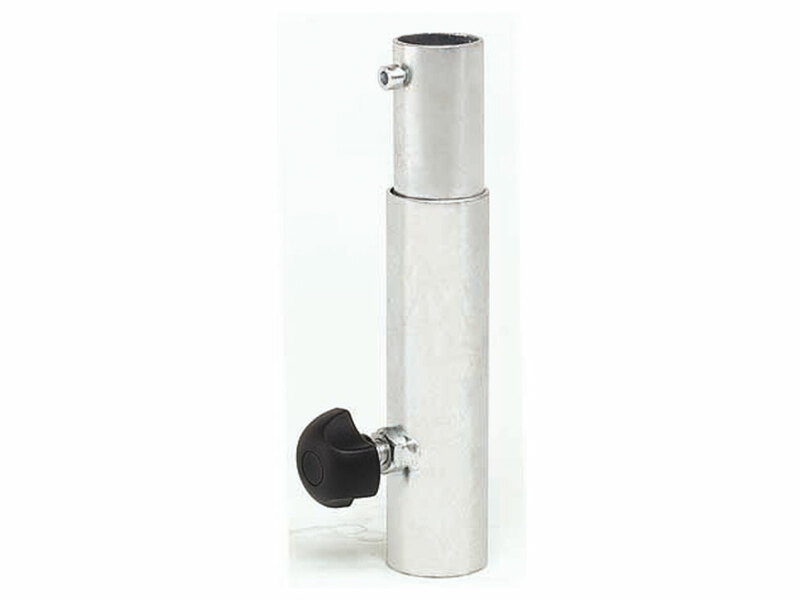 LW 130 is suitable with many accessories thanks to its 35 mm diameter tube. 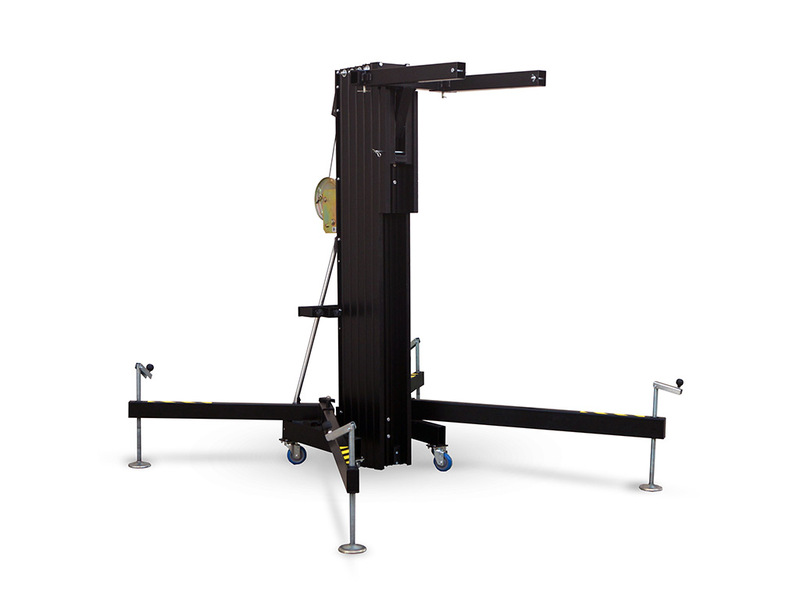 This strong lifting stand is made of steel for a better resistance. 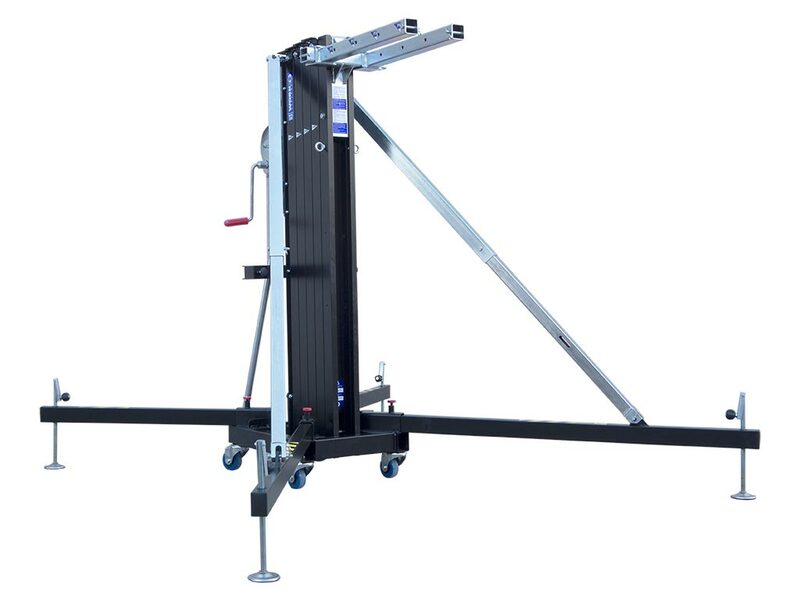 LW 130 has an automatic brake winch to lift loads up to 100 kg at 3 m.
Accessories: AW 137 / AW 237 / AW 337 / AW 537 / AW 2/37 / CP1 / P2 / AW 1. 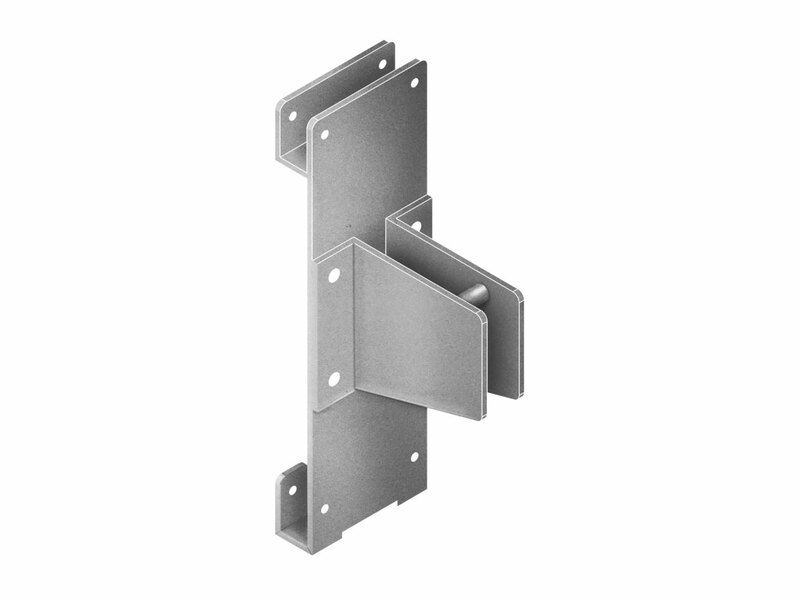 Three extensible profiles made of steel. Compatible accessories: AW 135, AW 235, AW 335, AW 535, AW 10, AW 1/35. 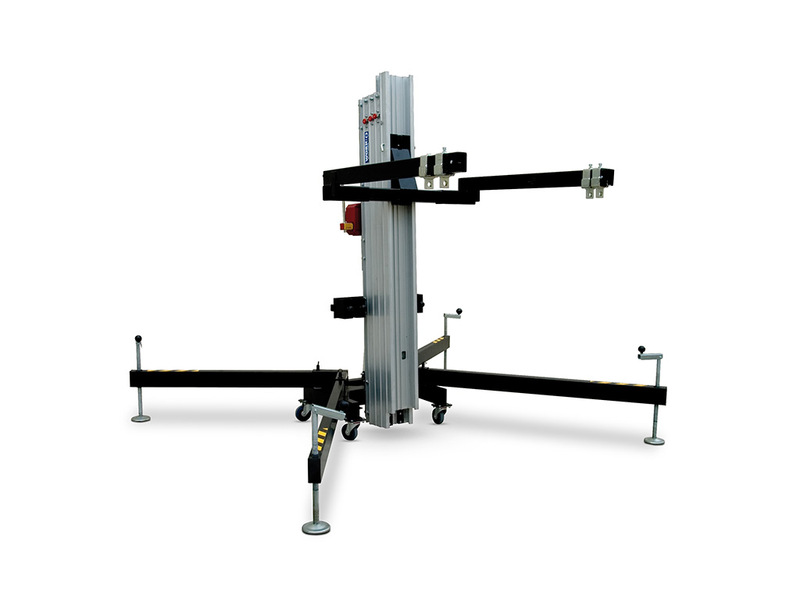 Four extensible profiles made of steel. 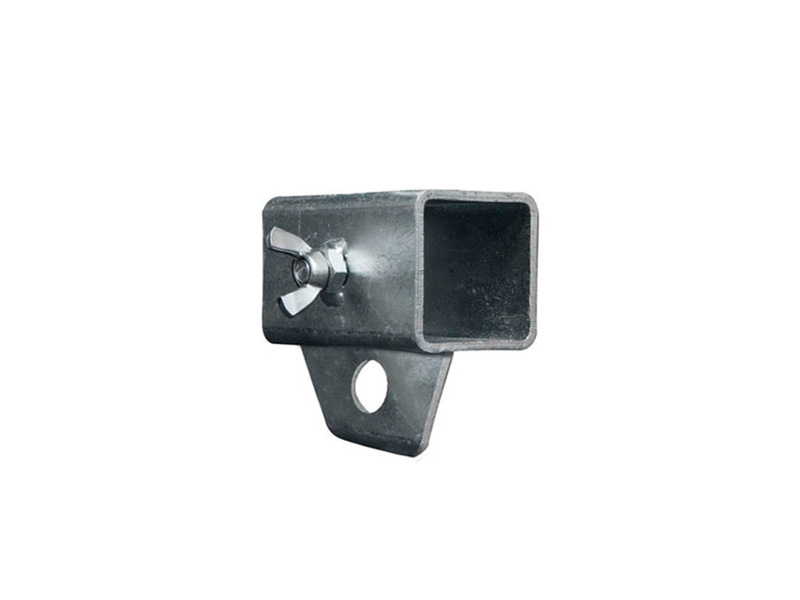 Five extensible profiles made of steel. 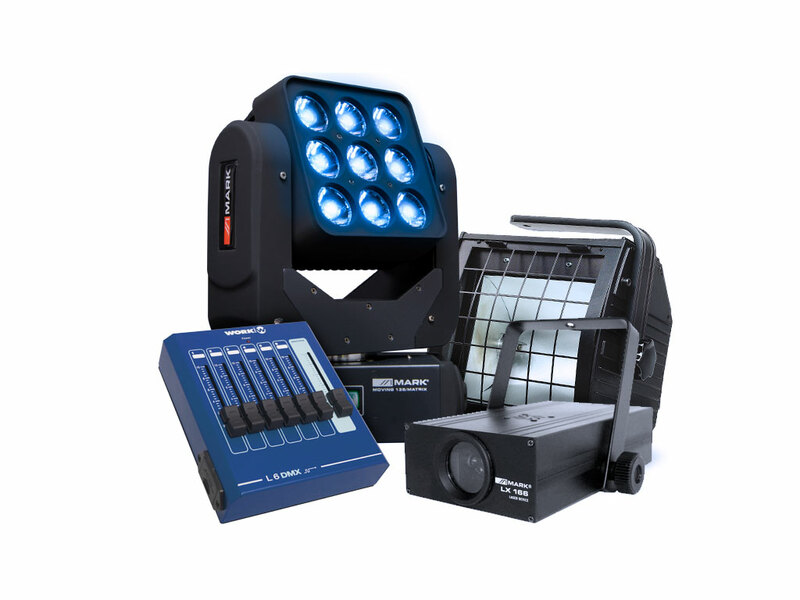 Compatible accessories: AW 140, AW 240, AW 340, AW 540, AW 12. 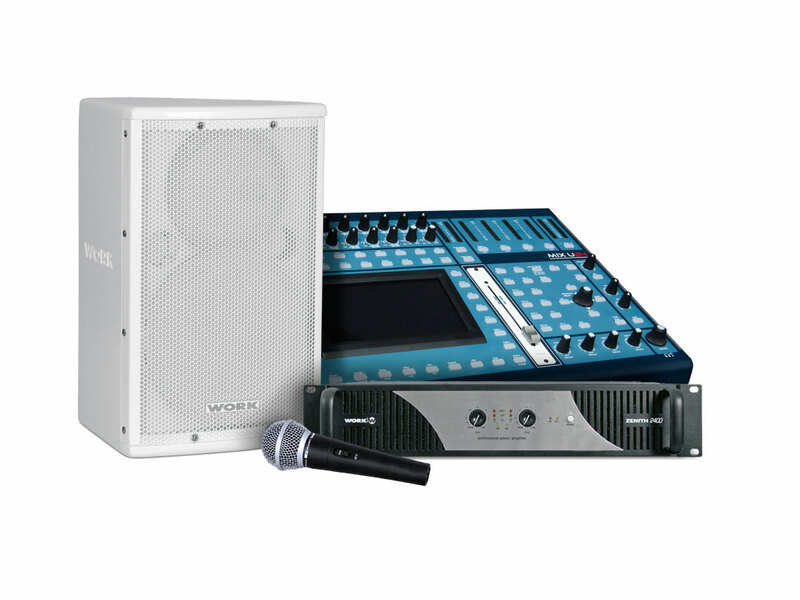 Compatible accessories: AW 150, AW 250, AW 550. 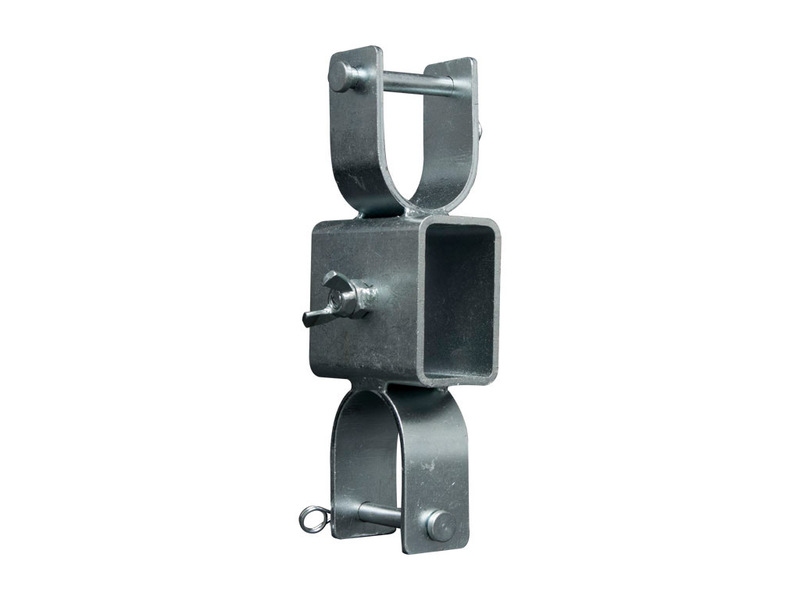 - Three extensible steel sections. - Reduced size / fits in all type of vehicles. - Diameter: 35mm / compatible with many accessories. Load: 100 Kg. Ø 35 mm. Height 4,05 mt. Weight 28 Kg. 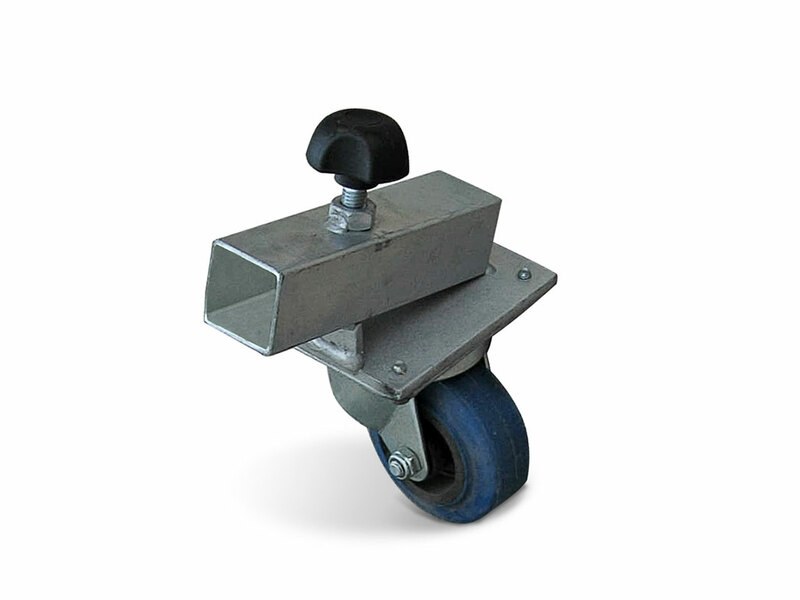 Two wheels at the base of the lifter + handle for a convenient transport. 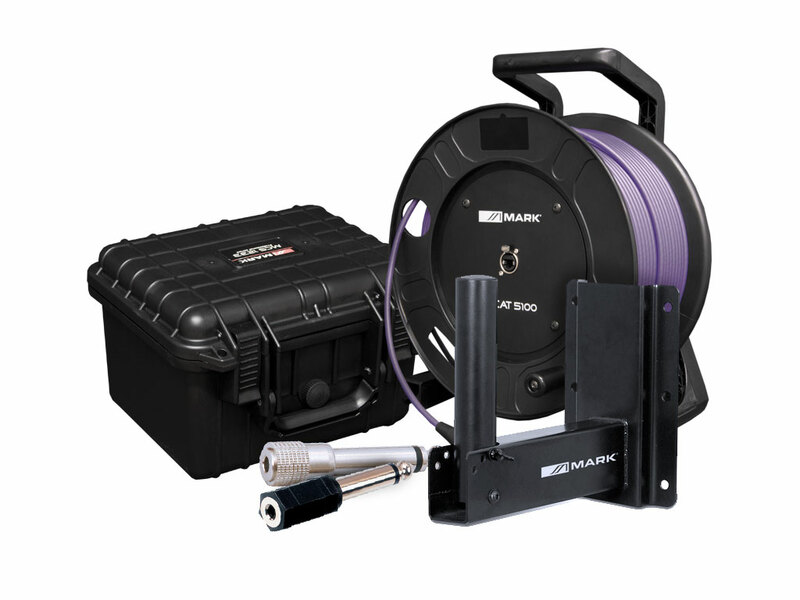 35 mm diameter / suitable with many accessories. 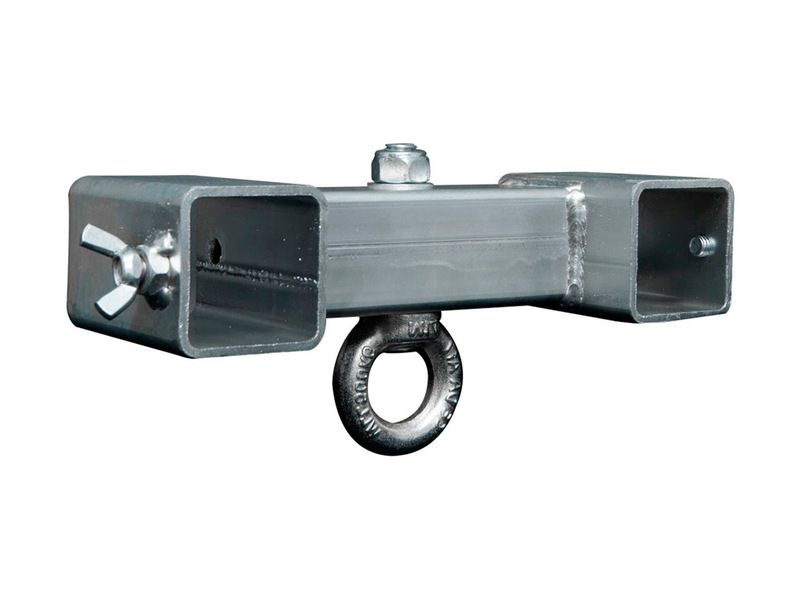 The high quality automatic brake winch has been designed according to the VGB 8/10.93 norm and TÜV 9591009 certifi cate. 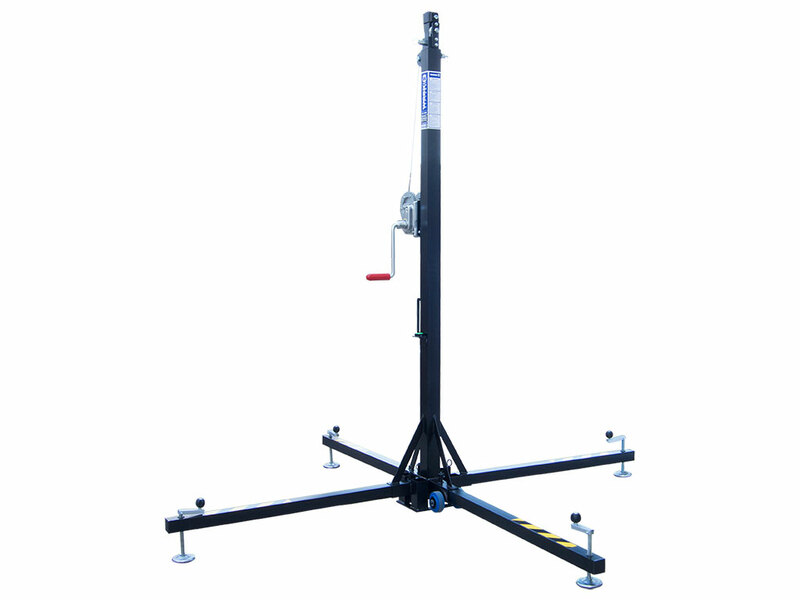 For more convenience during transport, stabilizer legs are put in the space provided. Pulley system and safety pin on each section. 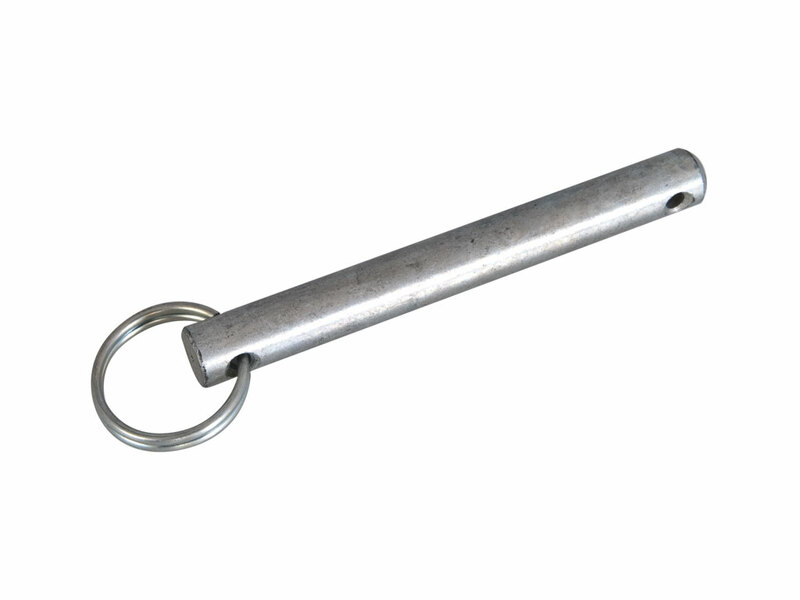 Vertex with reinforcement. 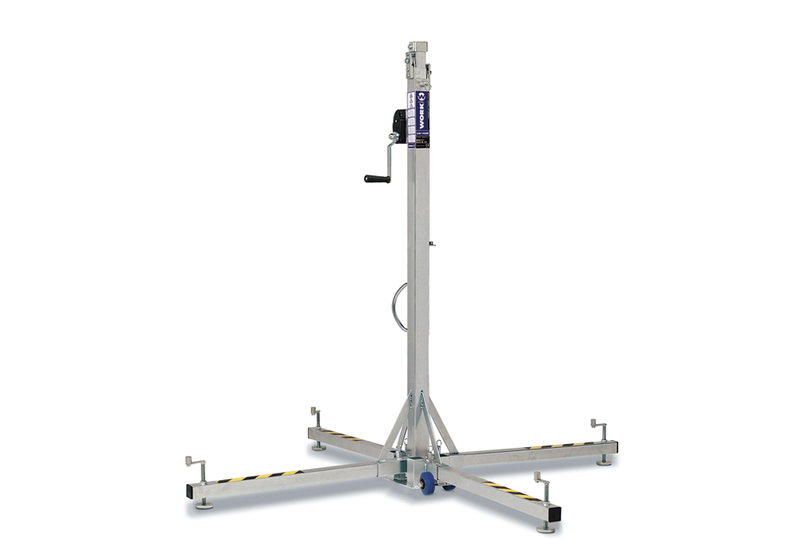 LW 142 R features a bubble level vial, useful to balance the lifter and ensures vertical lifting, protecting load from inadvertent movements. 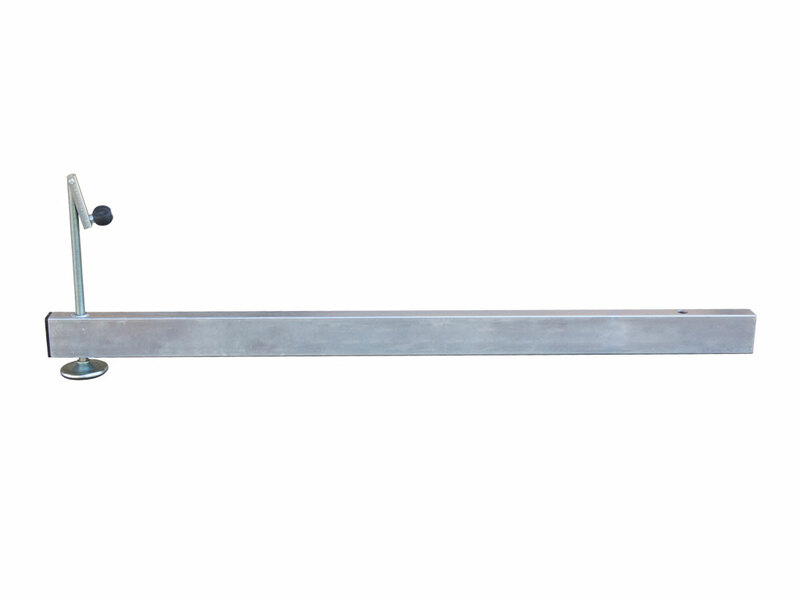 Handle located on the body of this lightweight lifter for transport. 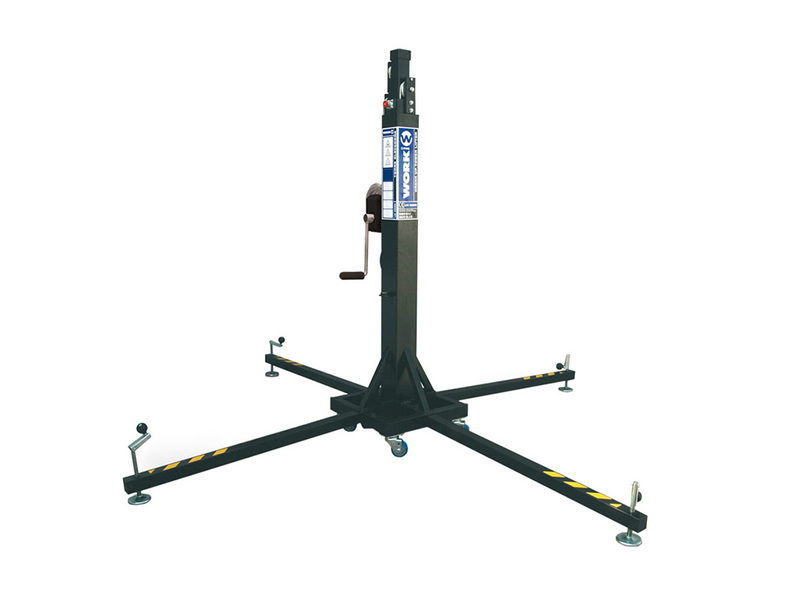 Two wheels at the base of the lifter allow an easy transport. 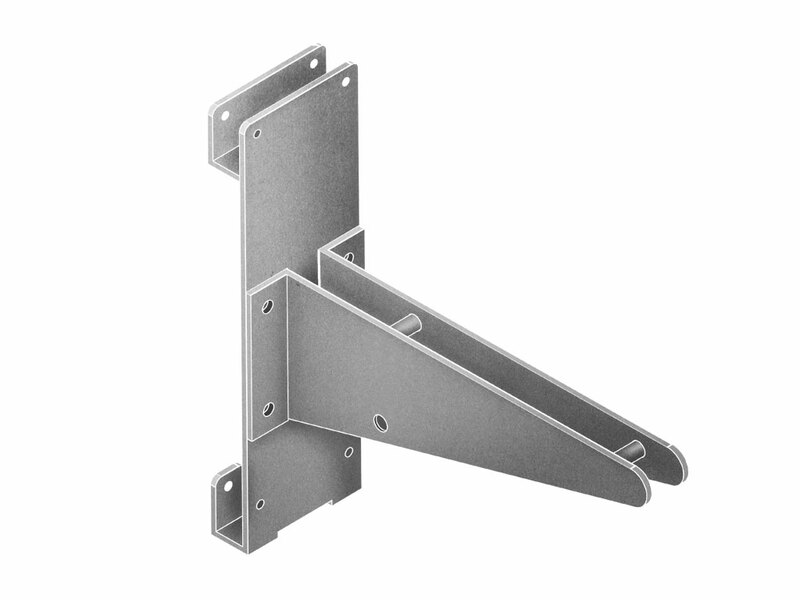 Two extensible profiles made of steel. Space provided for stabilizer legs during transport. LW 135 R features a bubble level vial, useful to balance the lifter and ensures vertical lifting, protecting load from inadvertent movements. 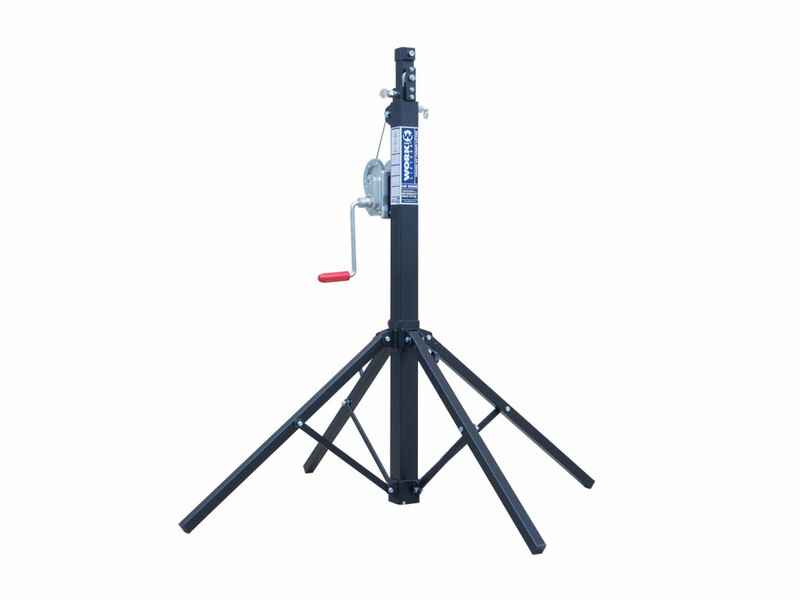 Handle located on the body of this lightweight lifter for an easy handling. 55 mm diameter / suitable with many accessories. 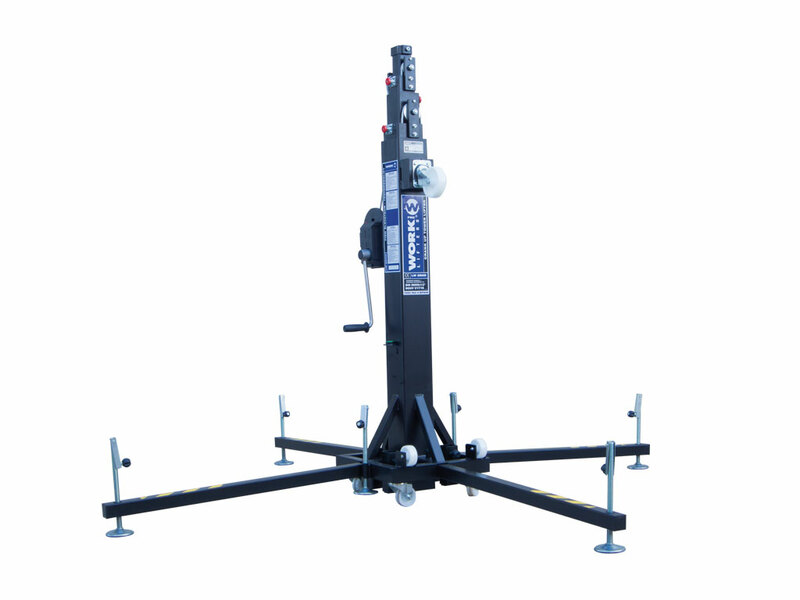 LW 255 R features a strong, high quality automatic brake winch that allows heavy load lifting. It has been designed according to the VGB 8/10.93 norm. 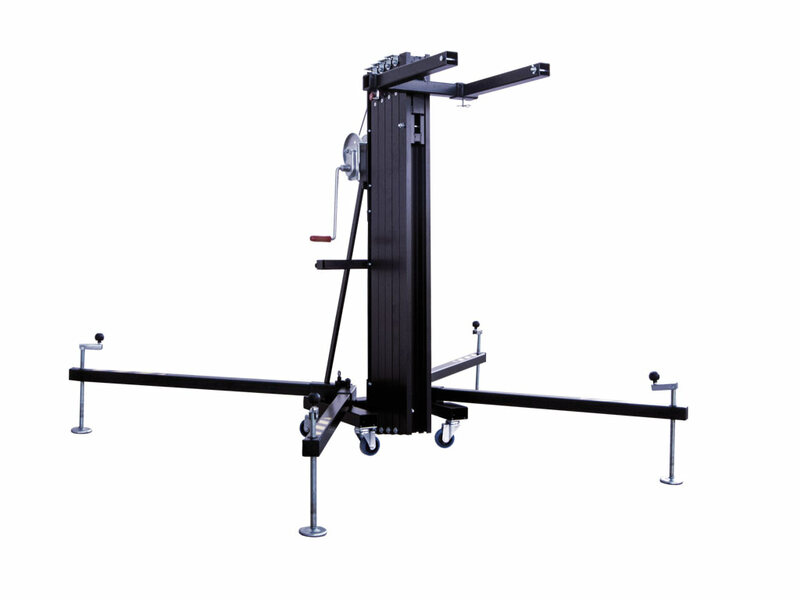 In order to move it easily, four wheels have been added at the base of the lifter. 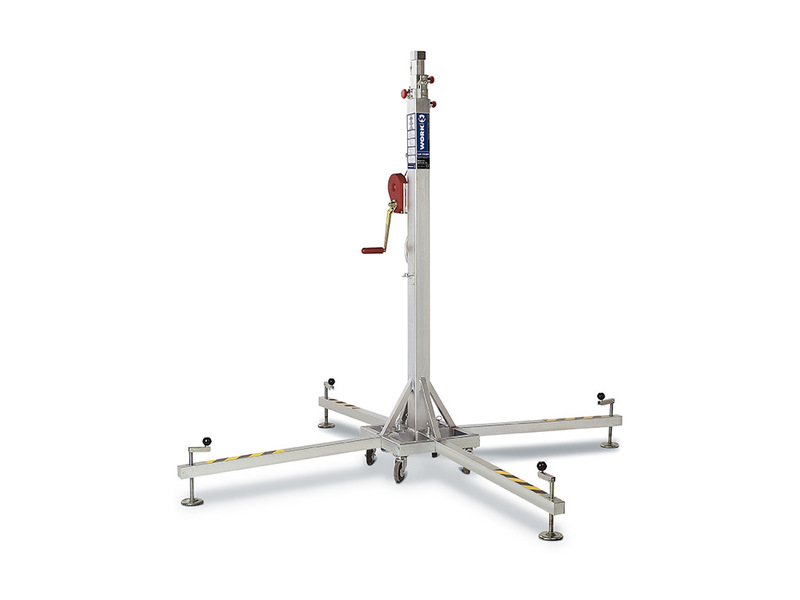 LW 255 R features a bubble level vial, useful to balance the lifter and ensures vertical lifting, protecting load from inadvertent movements. 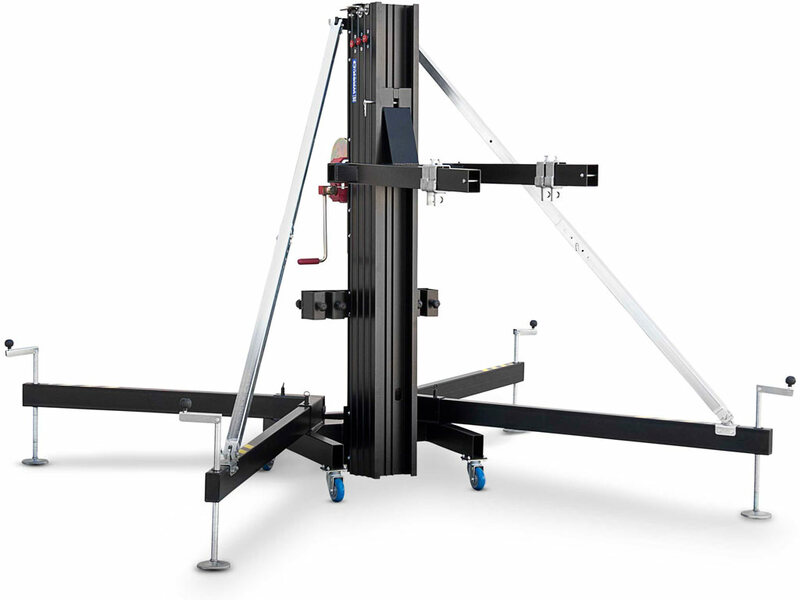 Additional stabilizer on the center of the tower for an optimum distribution of the load. 50 mm diameter / suitable with many accessories. 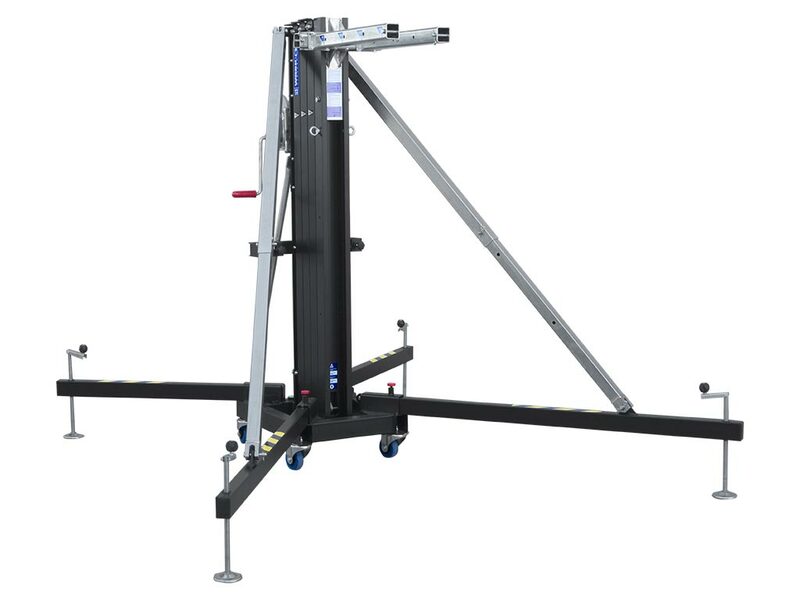 LW 290 R features a strong, high quality automatic brake winch that allows heavy load lifting. It has been designed according to the VGB 8/10.93 norm. 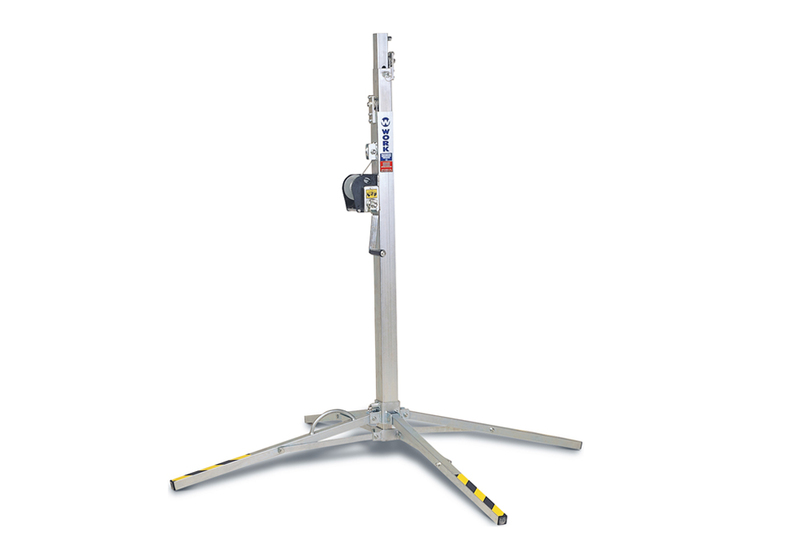 The base of LW 290 R has an additional stabilizer that makes lifting operation safer, due to the heavy loads this lifter holds. 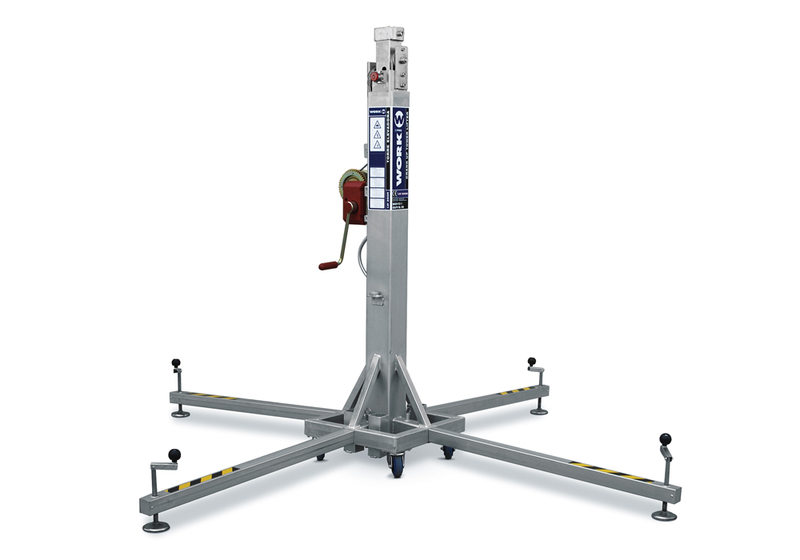 LW 290 R features a bubble level vial, useful to balance the lifter and ensures vertical lifting, protecting load from unexpected movements. 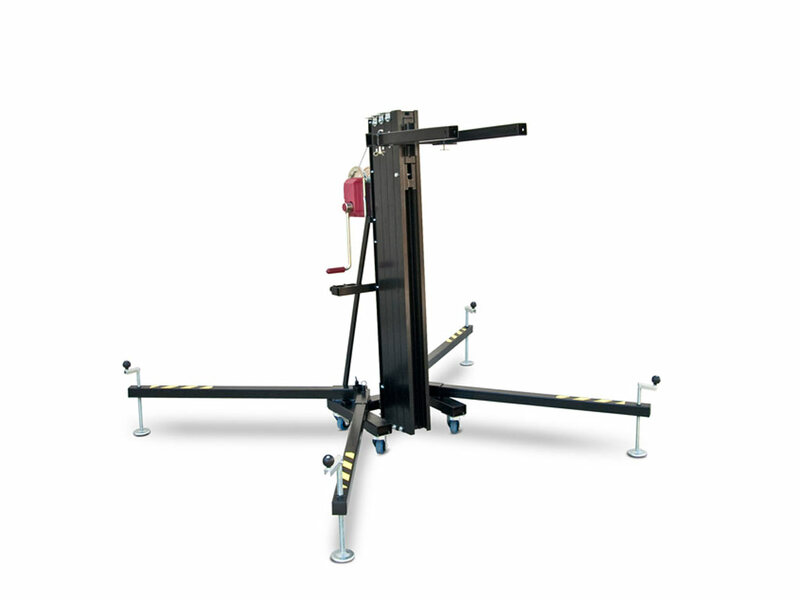 Four wheels have been added at the base of the lifter to move it easily. Ruedas adicionales para el tranporte de la torre en posición horizontal. You can not order products without stock or whose stock is less than the quantity requested. 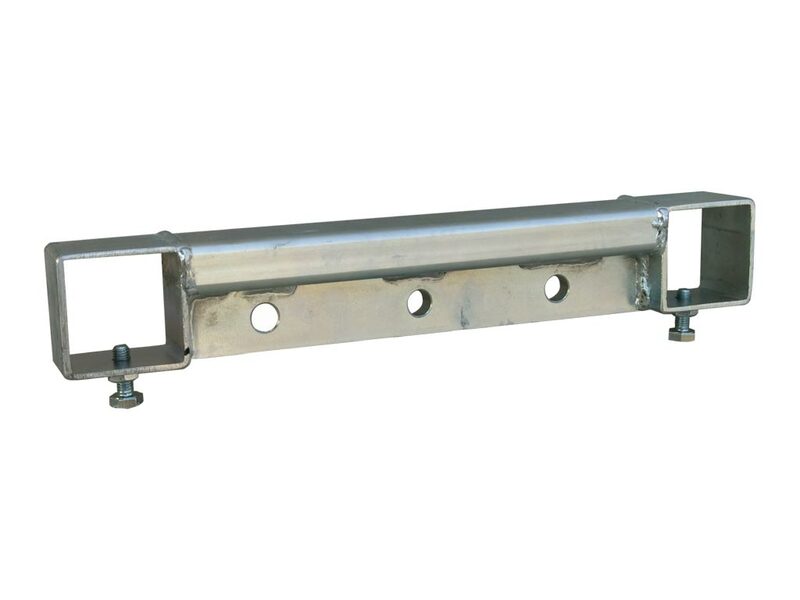 The high quality automatic brake winch has been designed according to the VGB 8/10.93 norm. 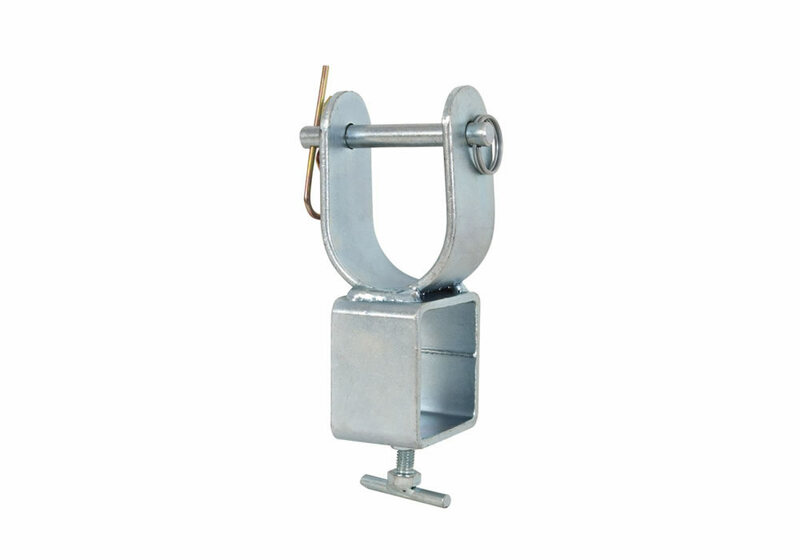 Handle located on the body to transport the lifter. 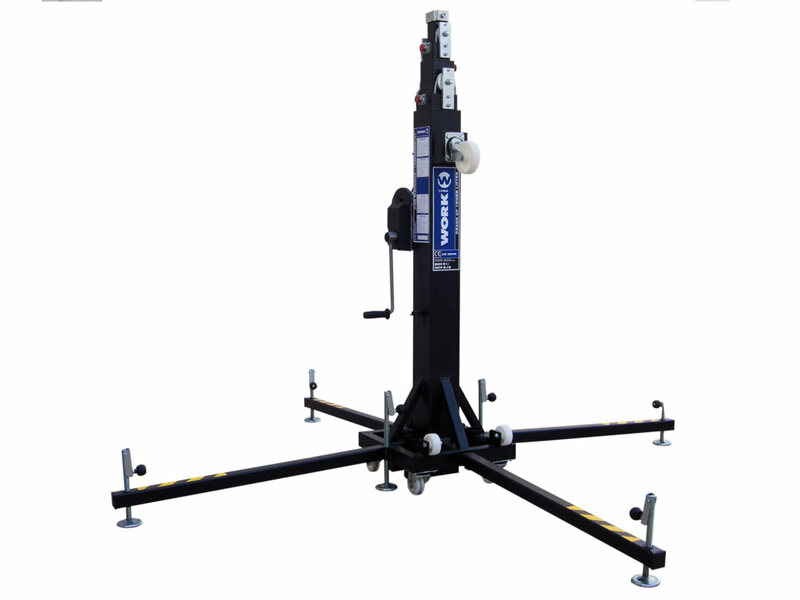 Contrary to previous models, LW 155 R is a 4 wheel base lifter. 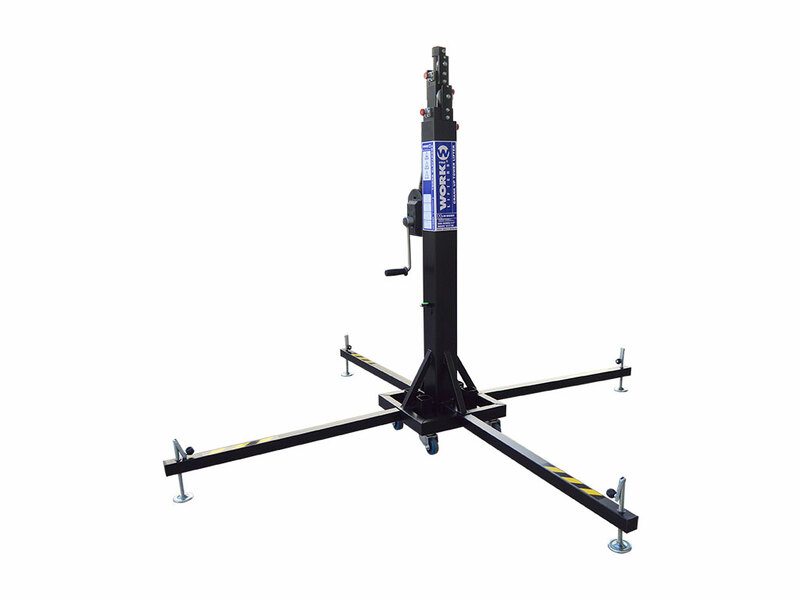 For more convenience during transport, stabilizer legs are put in the space provided. 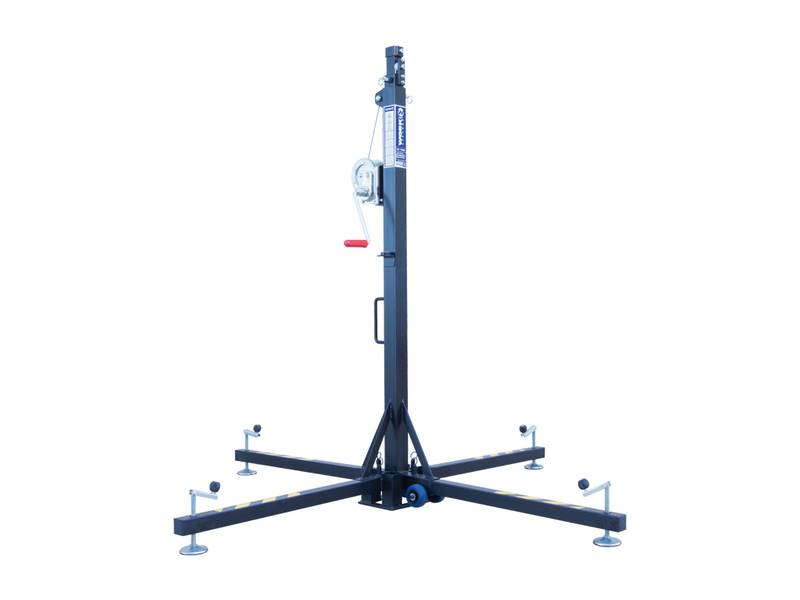 LW 155 R features a bubble level vial, useful to balance the lifter and ensures vertical lifting protecting load from inadvertent movements. Available colour: Silver metal and black. 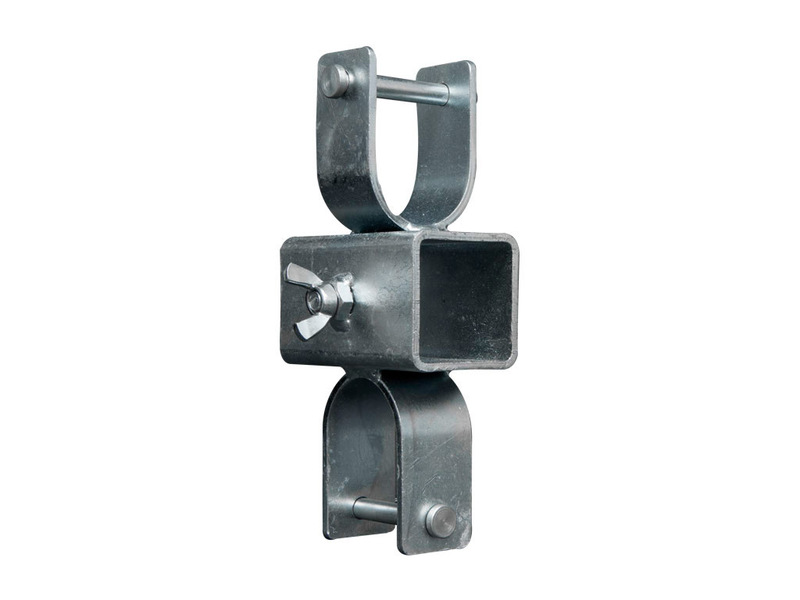 WT 150 has reinforcing bars that help to withstand the weight of the load during operation. 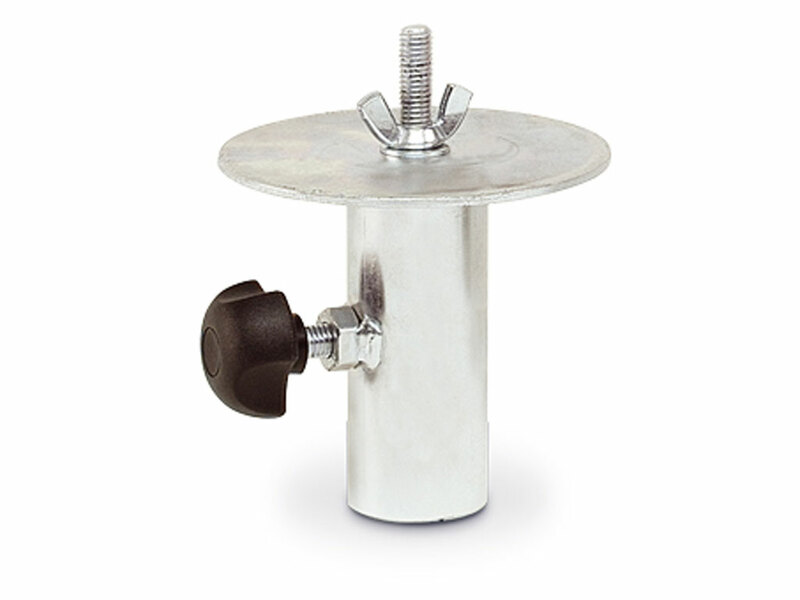 patented steel profile cap designed for added rigidity to the lifter. 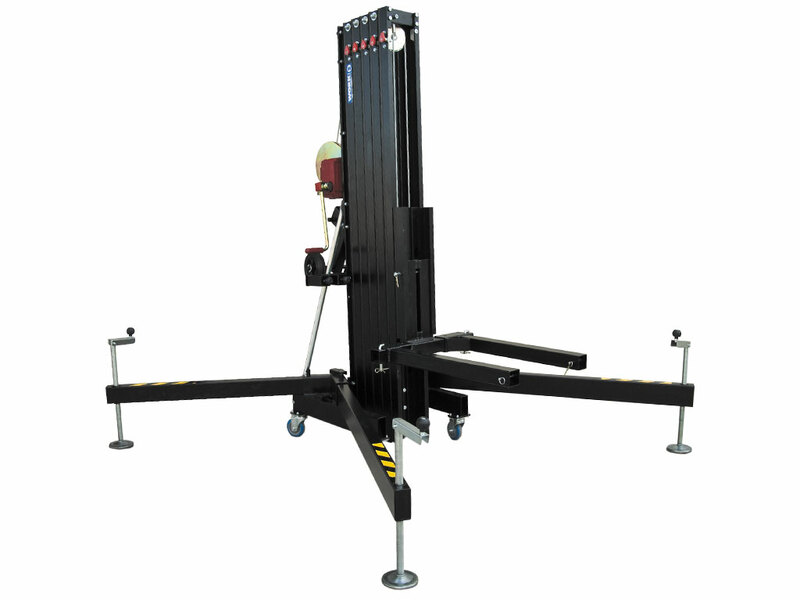 Distance between legs gives the lifter a better stability. It also provides a space suitable for subwoofer location. 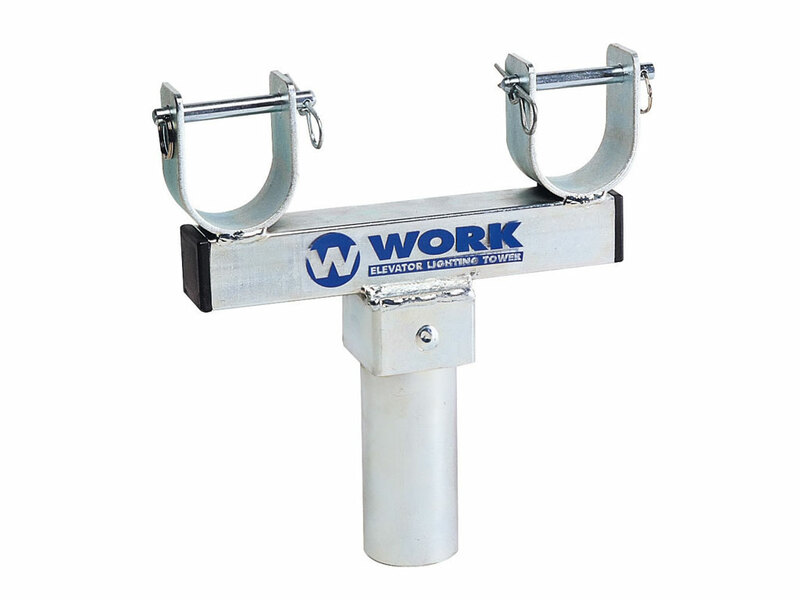 WORK® cares particularly for the quality of automatic bracke winches. They have been designed according to the norms 2006/43 EG, EN 13157 and EN 1200. 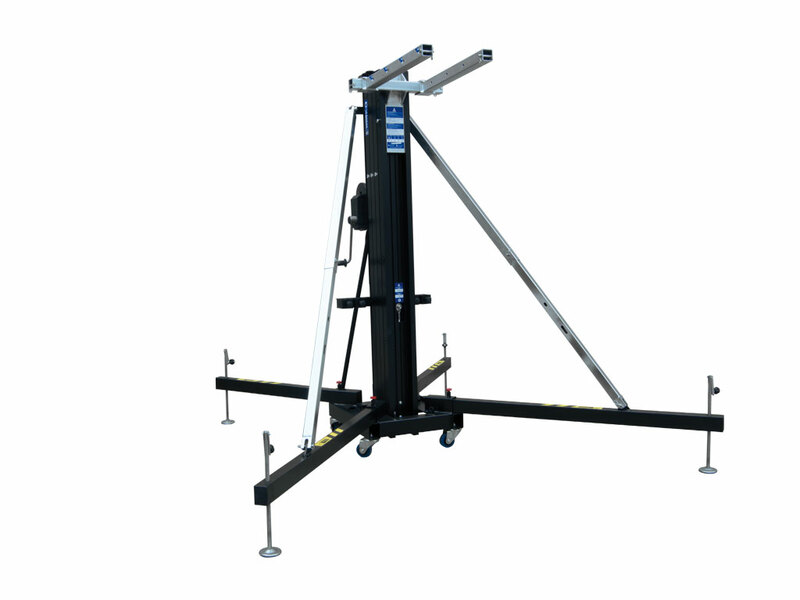 WT 150 perfectly fits in commercial vehicles. 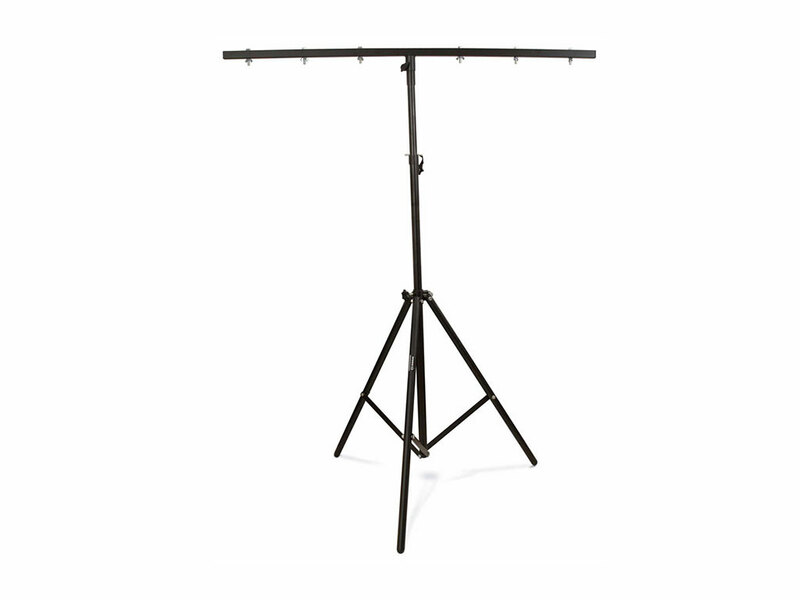 It only measures 166 cm long when it is folded. 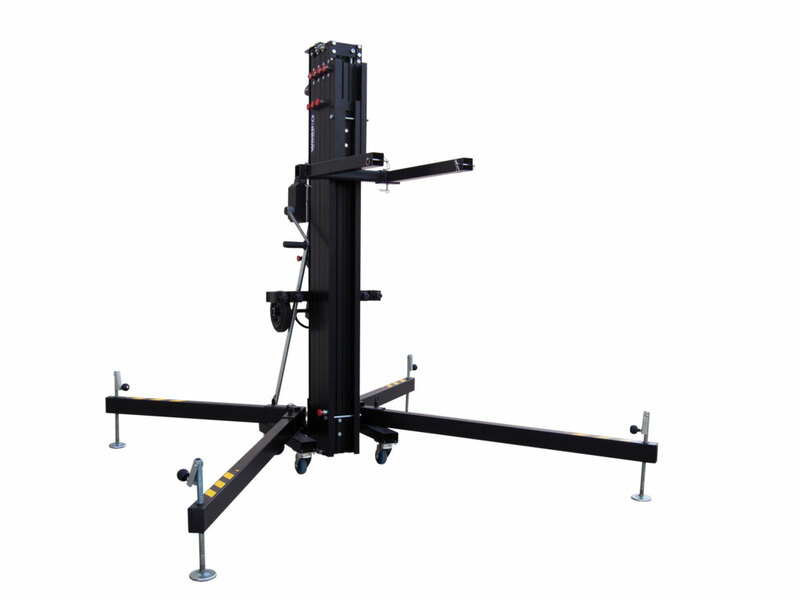 WT 150 is fitted with castors making movement effortless. 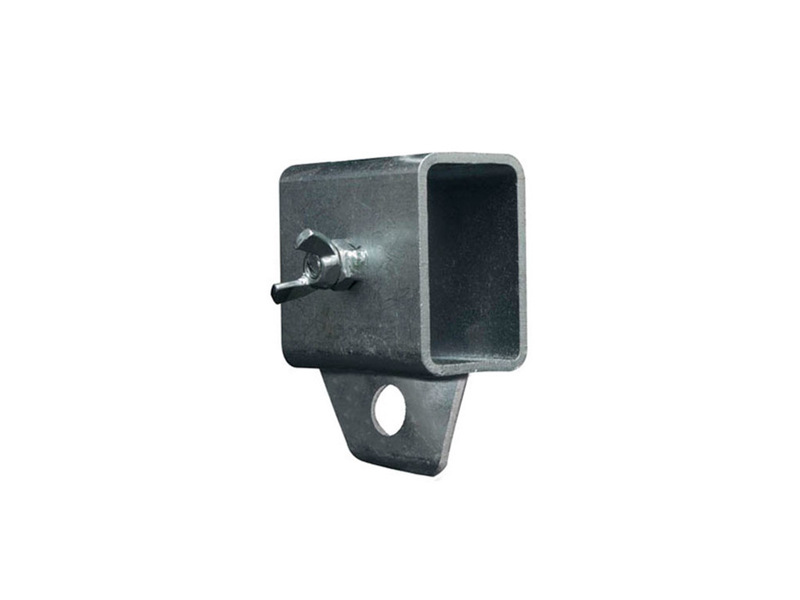 WT 150 has been designed for Line Array systems, that is why it includes a frontal reinforcement for the bracket. 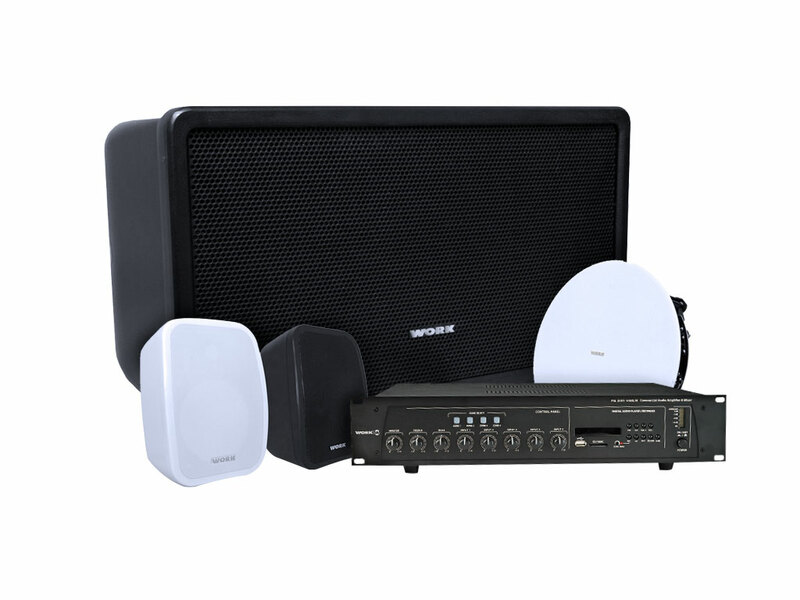 An optional fixation system provides asafe and easy installation of the Line Array speaker. 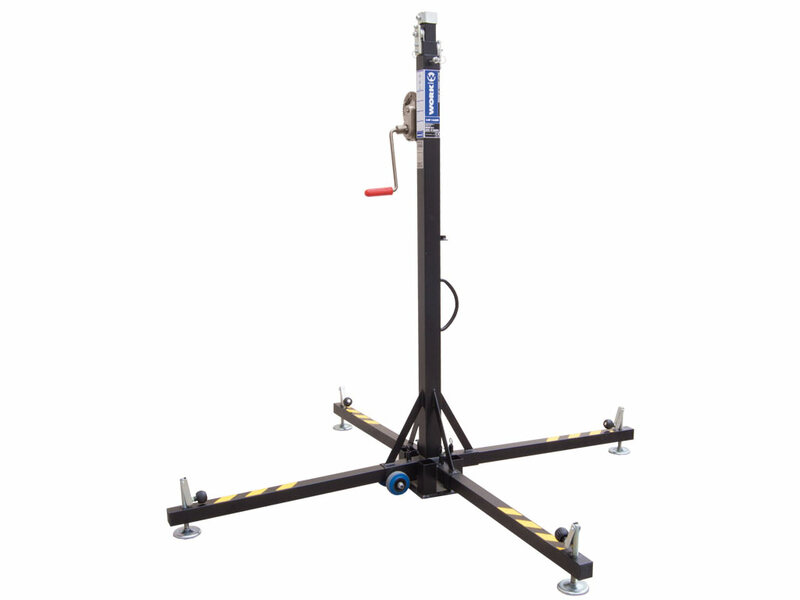 High resistance stabilizer legs with rubber made bases to be fixed on any surfaces. 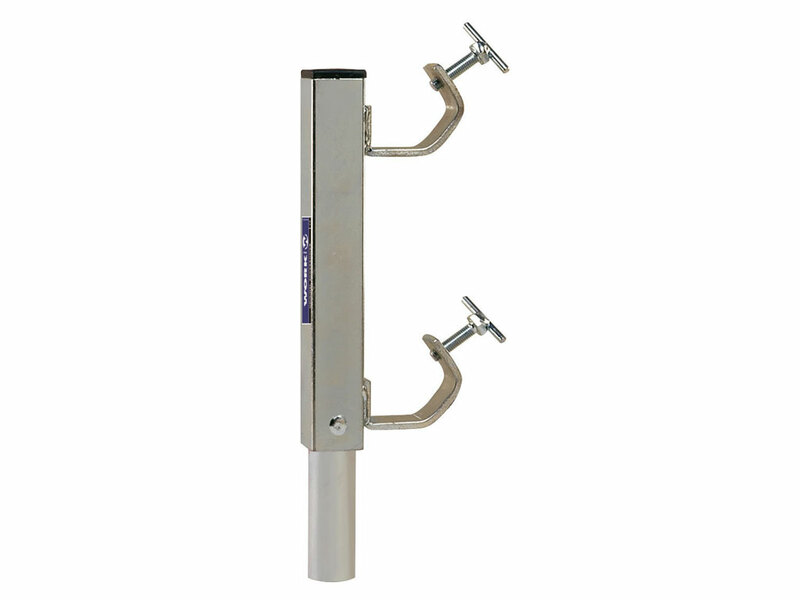 Spirit level for vertical lifting. It also prevents from inadvertent movements.